Well, there was a lot crammed in that episode. 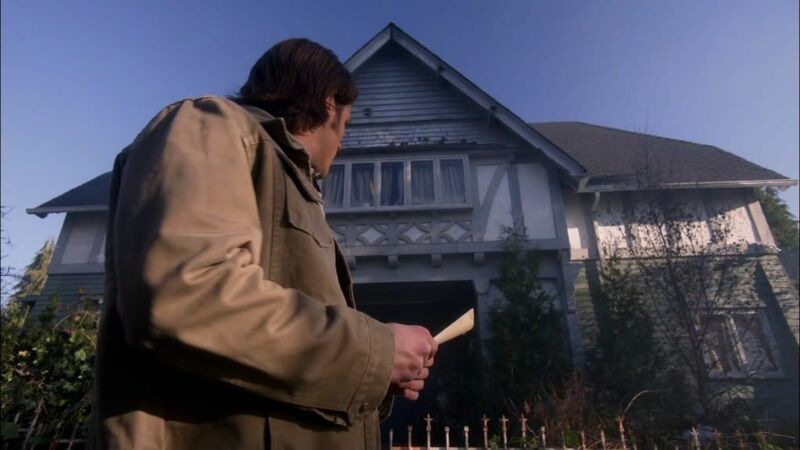 A new myth arc, additional John backstory, Grandpa Winchester, and the key to it all. Adam Glass wrote this episode and he's written quite a few in the last couple of seasons, among them Like a Virgin, Mommy Dearest, Party On, Garth and Southern Comfort. There are a couple of elements of this plot that are similar to the resolution of a couple of his others. 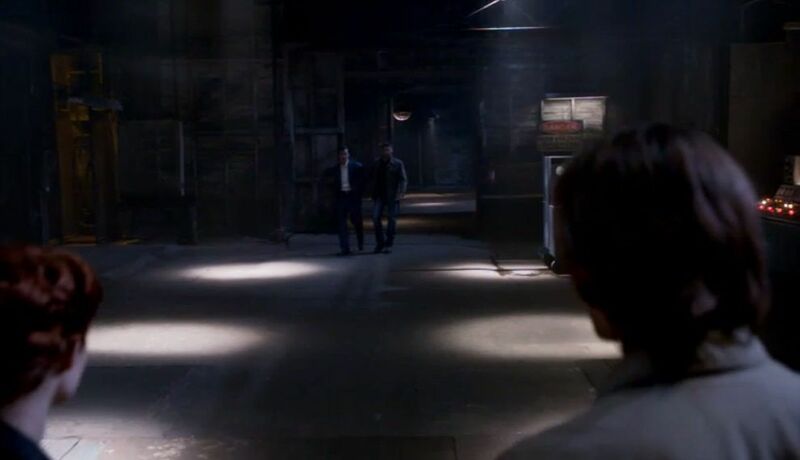 In this one, when Dean sent Henry across the warehouse to Abaddon, we don't know everything that happened between Henry and Dean while they were off screen. That's revealed in a flashback much the same way as the cursed coin's path is in Southern Comfort. 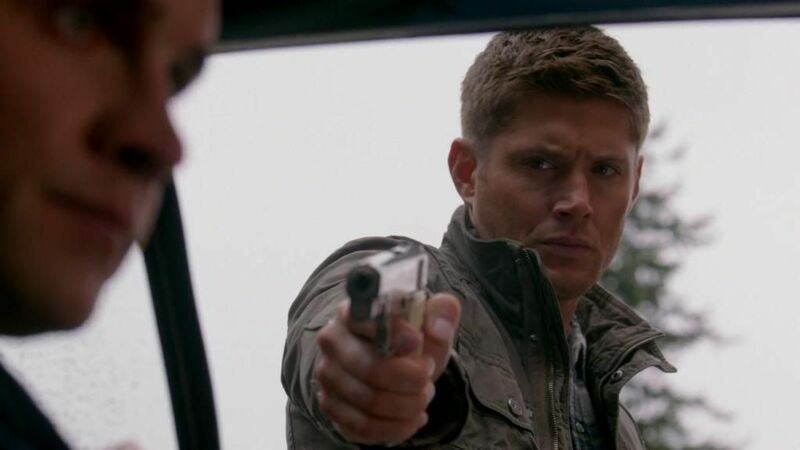 Dean has a surprise weapon that we are unaware of until the end, in this case a bullet inscribed with a devil's trap. 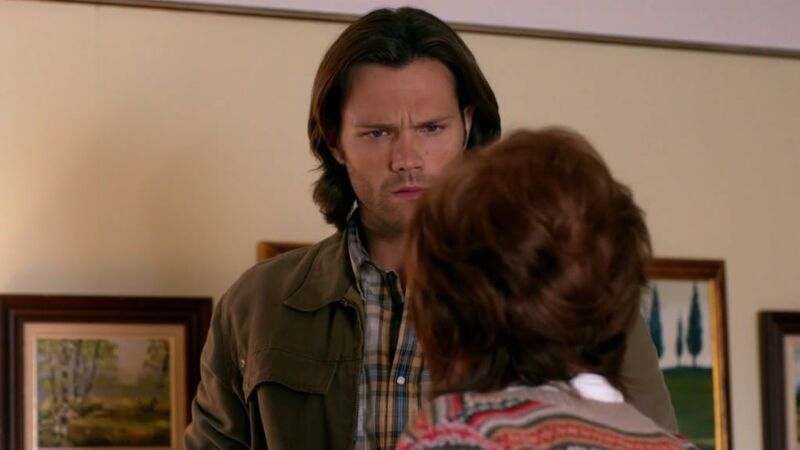 In Mommy Dearest, it was Dean himself after swallowing phoenix ash. It was a pretty solid episode on the whole. 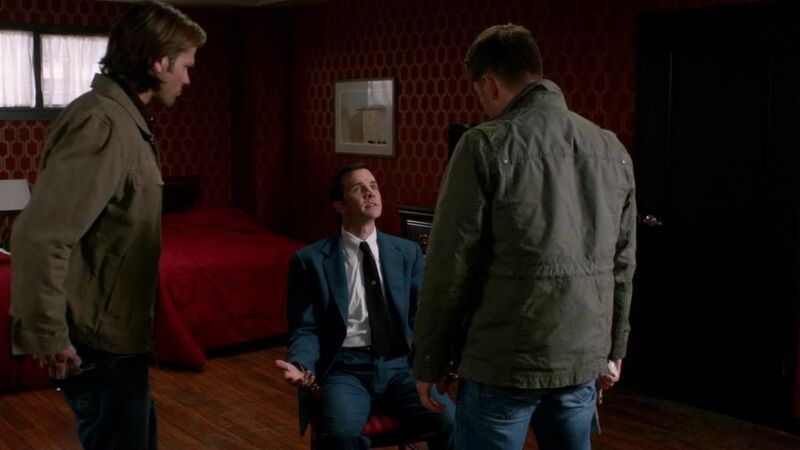 There were a couple of places where the dialog kind of bumped along and Dean did a lot more monologuing over Abaddon's head than might have been realistic considering his grandfather was bleeding out on the floor. 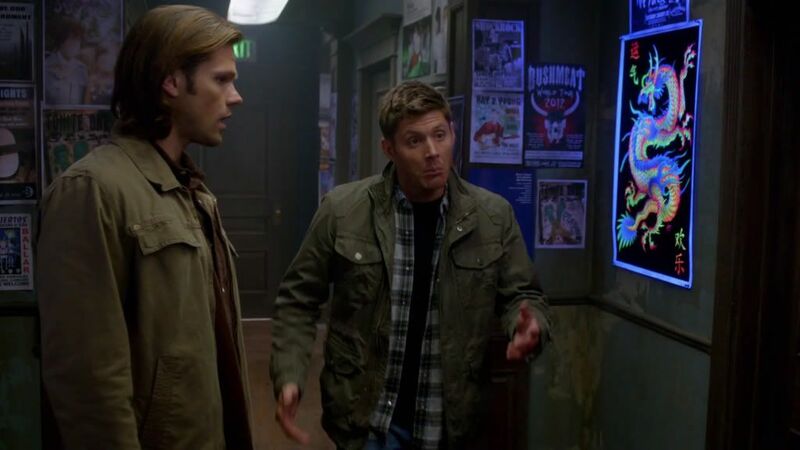 But the episode was fun to watch which pretty much trumps everything. 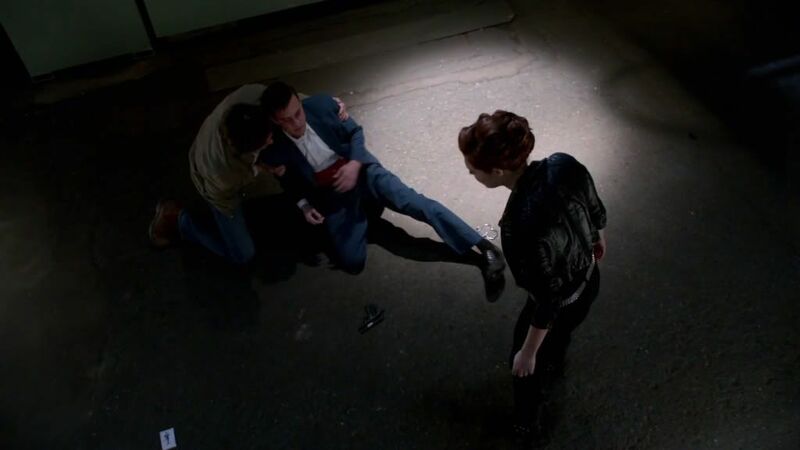 This was the first episode directed by Serge Ladouceur, SPN's Director of Photography. 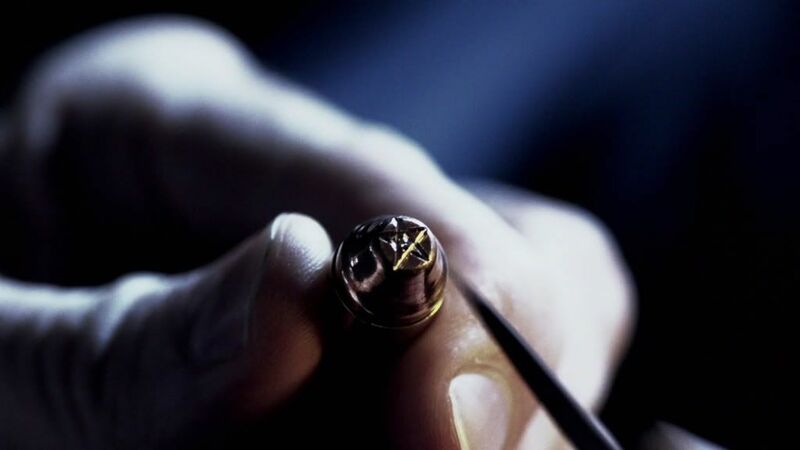 In a quote from the season 6 companion, he says that the job of the cinematographer is to create the looks and the moods through lighting, choice of colors, and the control of contrast. So basically, I'm a huge Serge fangirl. 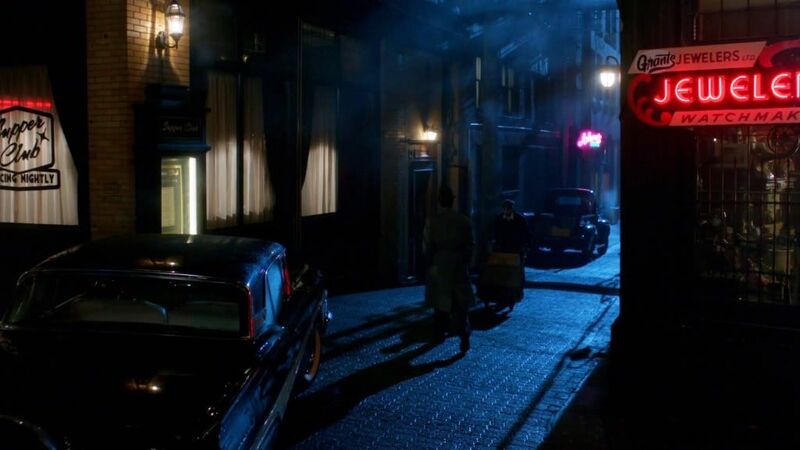 I love the look of this show with it's colors and lighting. All of that experience seemed to carry over into the way Serge directed the episode. 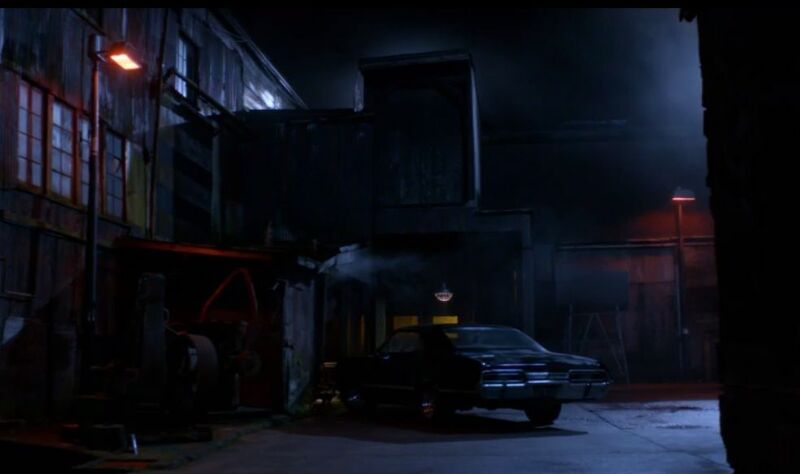 He had to work with a 1958 setting complete with a street scene, that same street and building in 2013, real time and a flashback to Dean and Henry in the car, a dark warehouse, a couple of motel rooms, a car escape, a diner, a witness's house, two trips to the cemetery, a hoodoo shop, and a talk by the side of the road. Pretty nice work all around. I like the new story elements that have been introduced and really wish we could have started the season with this instead of whatever that was we had instead. 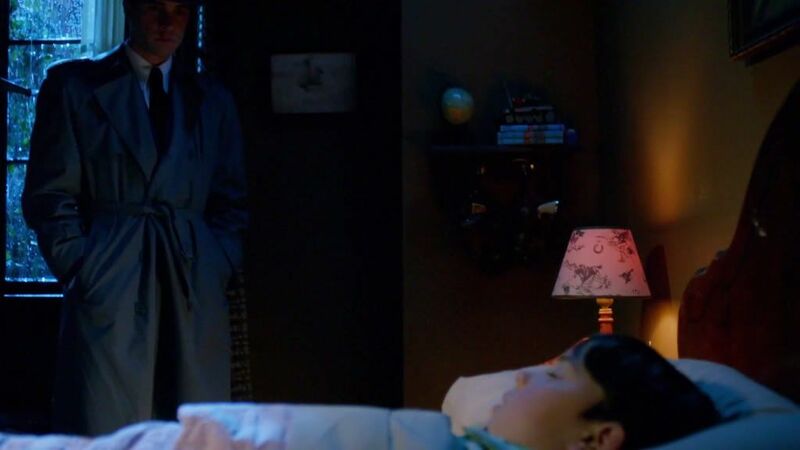 I'm sure that will have a place in the rest of the storyline (please don't let the agony - ours and Alfie's - have been in vain) but I like where this could go. I said that about Purgatory though, so what do I know? 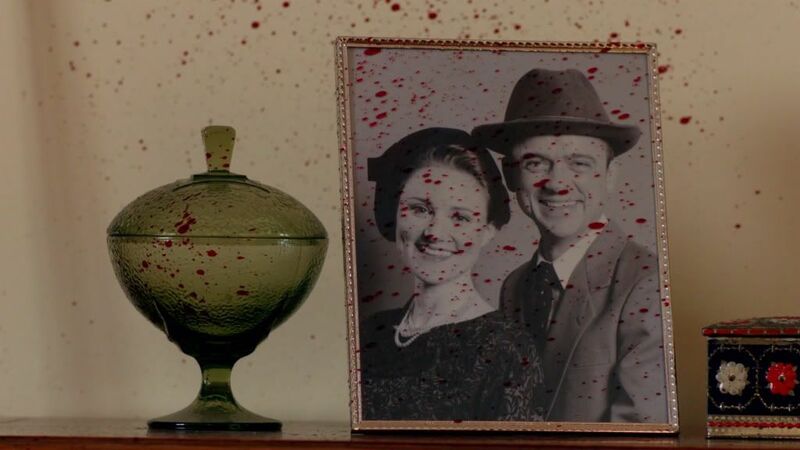 I'm glad that while digging into John's family history, they created a backstory that doesn't make him out to be more of a bad guy. If anything, I could generate a bit more sympathy for his character. I have a lot of questions about the first bit of John's life before his Dad disappeared. He was four when he lost a parent which sounds familiar. 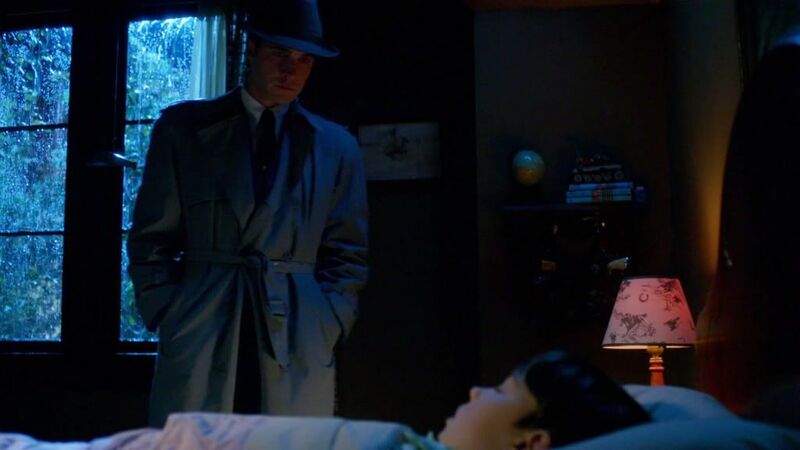 I know this is SPN and no one grows up with a mother (except Mary and fatherless Jo and Adam) but John appears to have been living a stereotypical 1950's lifestyle and he must have been left in the care of someone when his Dad went to "work". I'm going to figure it was a mom and wonder if she knew what his father was up to. The family appears to be middle-class and Henry seems to be educated. If Henry was a legacy, where was the father before him and how long does it take to be fully initiated into the club. 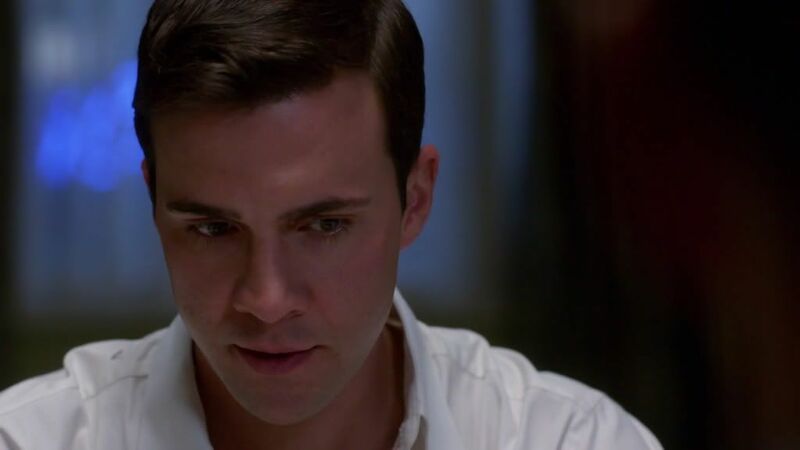 Was it Henry or John's mom with the right bloodline to be Michael's vessel? 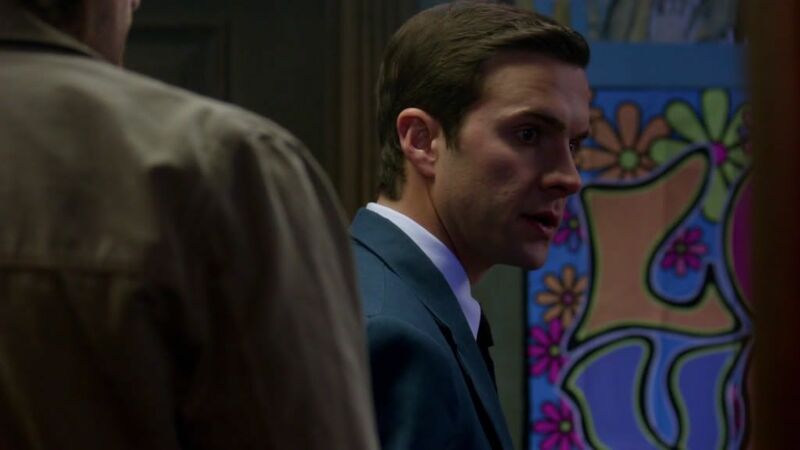 What happened after Henry disappeared? Somehow John ended up a mechanic from a family of mechanics and a very young soldier. 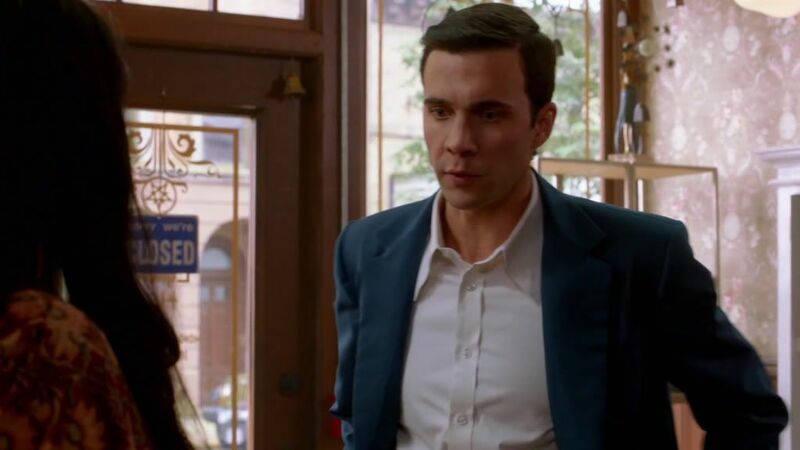 One characteristic of John in Season 1 is that he keeps things very close to his vest. He doesn't share information easily, even with those who probably should be in the know. It sounds like Henry may have kept that same practice. 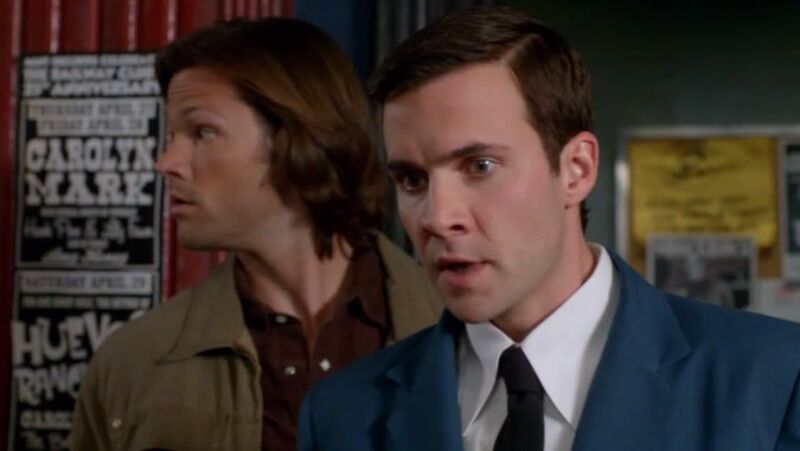 It is convenient that Henry was lost to the world in time travel during the whole apocalypse business where his knowledge would have been invaluable. Presumably the angels and demons involved knew about the Men of Letters because they bothered to get John and Mary, the daughter of hunters, together. 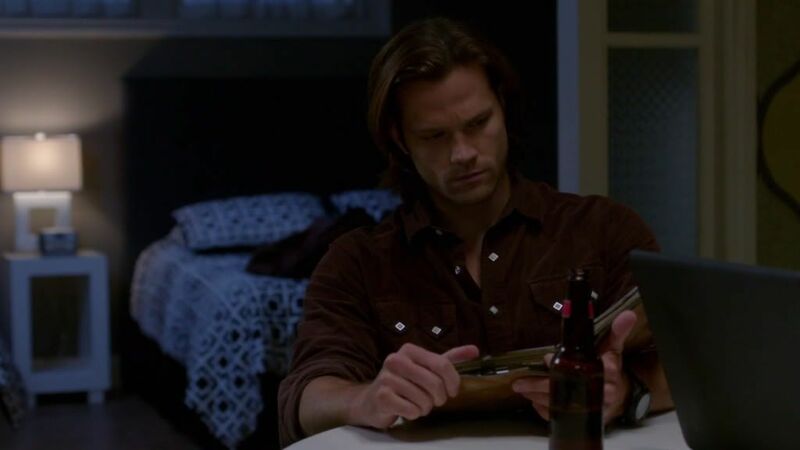 If the Men of Letters shared information with a few select hunters, you'd have thought Samuel Campbell would have known about them. I bet Sam Colt did. Why do I feel like this is all going to end with the box with the key in it in a large wood crate in a huge warehouse of a billion other crates? 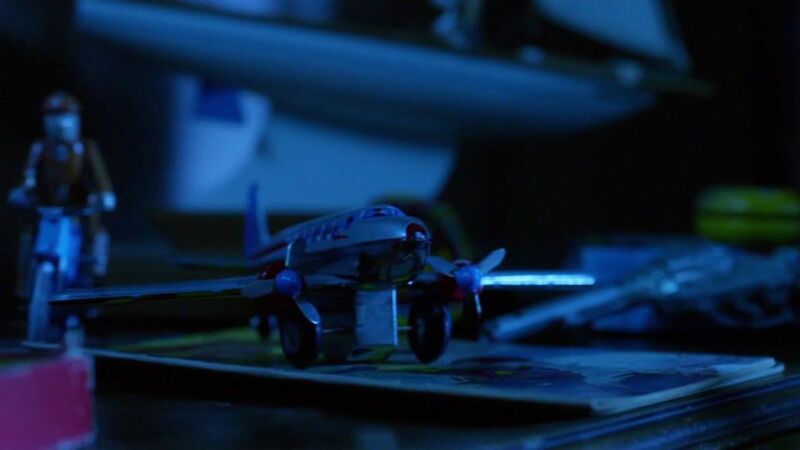 The beginning starts like a couple of our episodes have started, with a look at small toys. 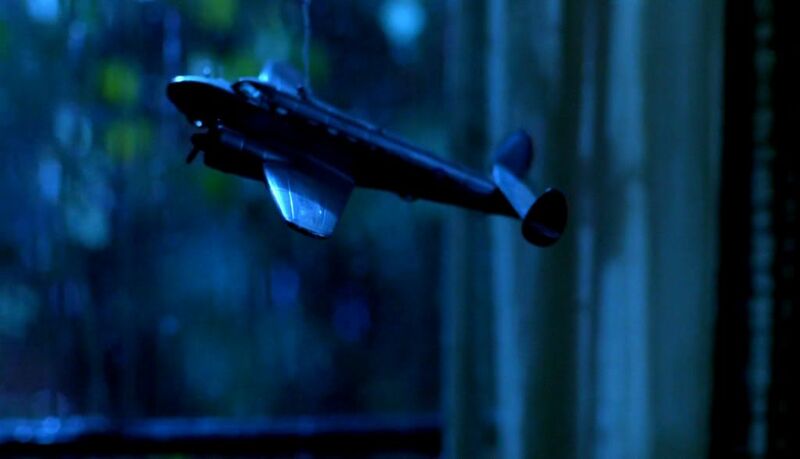 The light is very blue. 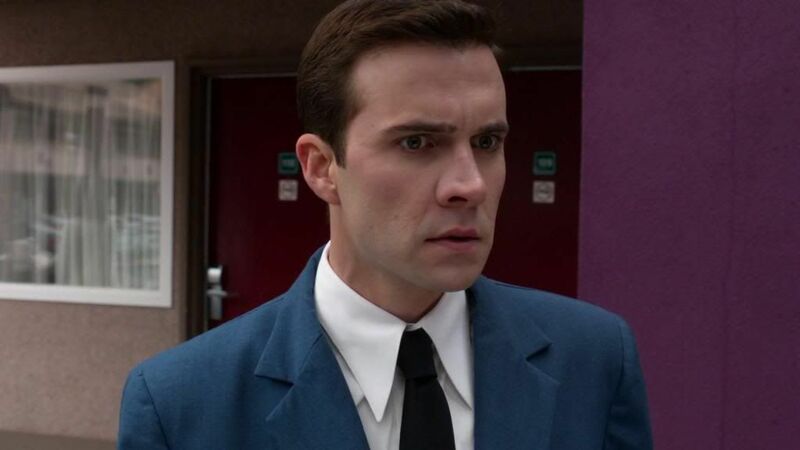 There is a lot of blue around Henry for the rest of the episode. 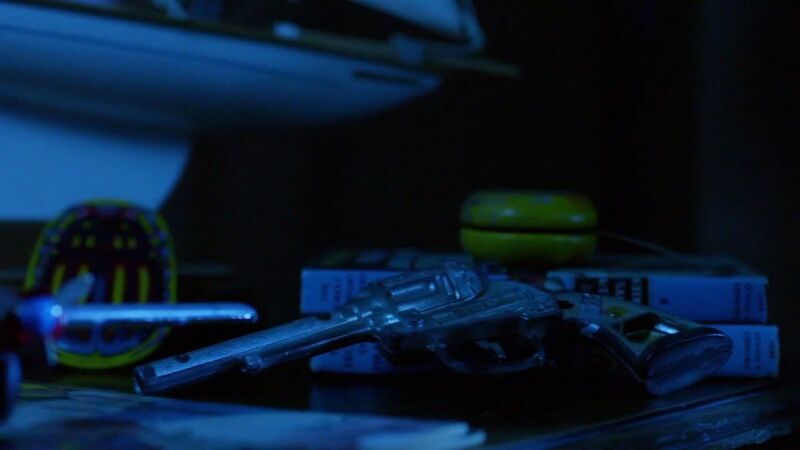 Yo-yo, toy pistol, sailboat and the Hardy Boys, a couple of mystery-solving brothers. Passenger aircraft, comics and motorcycle dude. 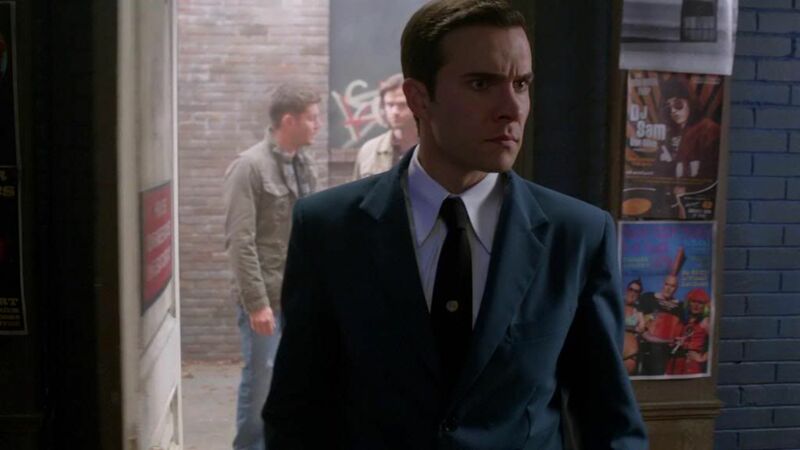 There's a man in a trenchcoat and tie lurking and my first thought was "Angels?" The light near John is red and yellow but the globe and the Hardy Boys are still lit. Turns out this is the kid's Dad and he's going to work. I love the window. At the end, as his Dad leaves, John's left with red and yellow, a robot mechanic and a couple of toy soldiers. 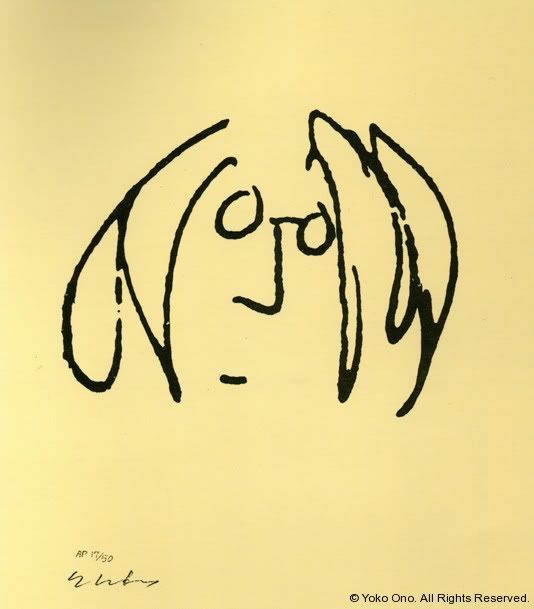 Seems like that was the life he was left with, too. Then we get a look at a 1958's street scene complete with a supper club and a jeweler. They picked a good street for this with the brick pavers. I love the old cars. The light is very blue here too with just a touch of red. I really like the transition to a pita shop and antiques store. The street is still brick but now it really looks like an alley rather than a place where you'd like to be for dinner and dancing in the evening. The red on the building face is really prominent. bowtrunckle has a great comparison of the inside of the club and the comics shop in a comment here. Awesome window with the crest of the Men of Letters at the top. Who is this chick and what is she doing there? I never really did figure that out until I read the transcript. Her name is Josie and she's another initiate from what I could tell. Why isn't she listed in the newspaper article about the fire? Within a minute or so, it really doesn't matter who she is because she's possessed by the MotW. This room is great and they did a lot of work on it to turn it into the comic shop later. It's apparent the Men of Letters had some sort of wealth if the floor is anything to go by. 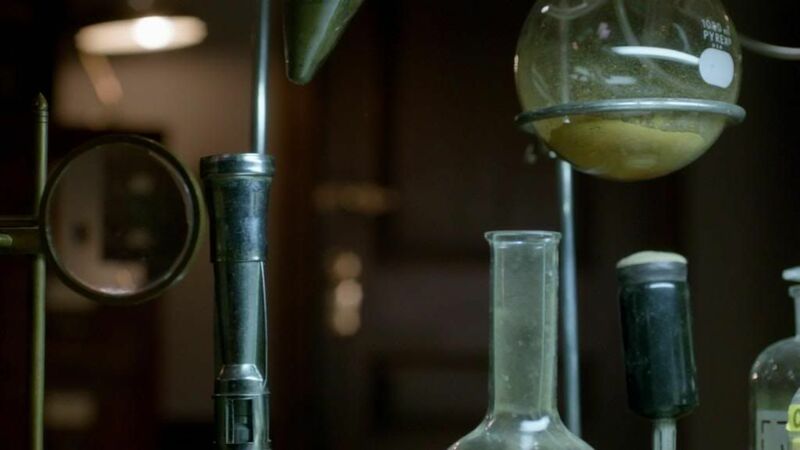 Great closeup of the lab equipment. 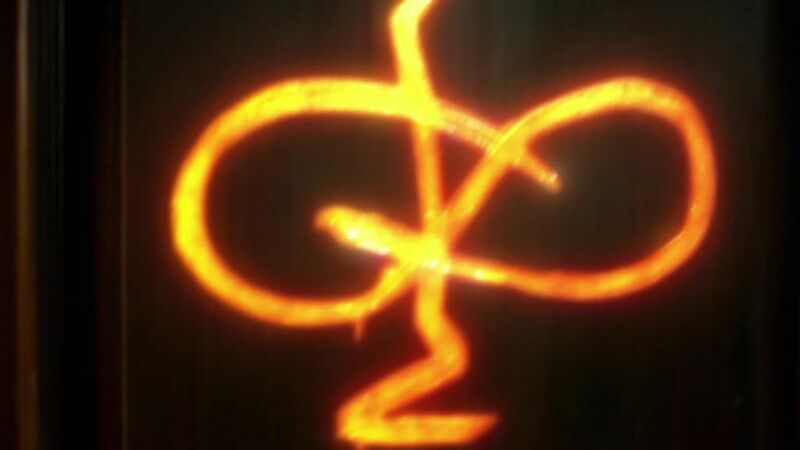 Then Henry makes this glowing sigil for time travel. This is the first thing I thought of when I saw it. He came in through a closet door (not the bathroom window). This is a pretty nice room by Winchester standards. The wallpaper has a very geometric pattern and it's red and gold. Henry brings the blue with him in his suit. This building has been used before. Time hasn't really made the color any more appealing. At the beginning of this part, there is a bass drum thumping like a heartbeat as Henry tries to figure out where and when he is. There are some no smoking signs that keep appearing this season and they're on the doors behind Henry. There's plenty of greenery to be had. 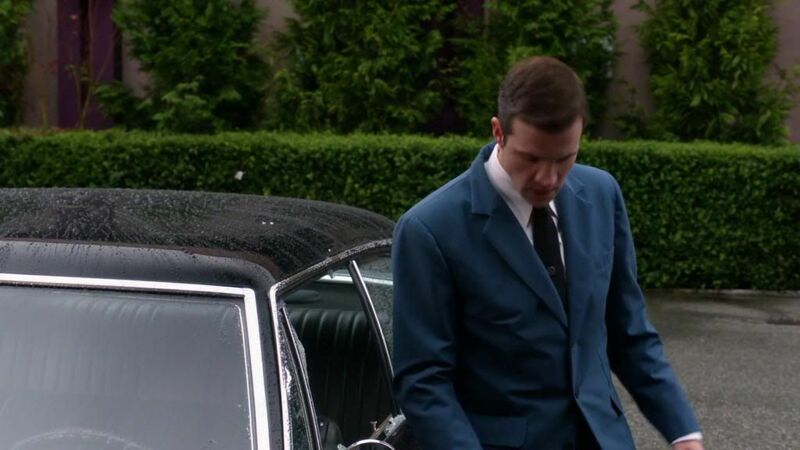 For a book guy, it's odd that Henry knows how to hotwire a car. Henry's blue stands out a lot next to all the red. Henry may know a lot about what's out there but he strikes me as being really naive about how it all works. For a man in a blue suit, he's very green and a snob. One of the themes for this season is perception. 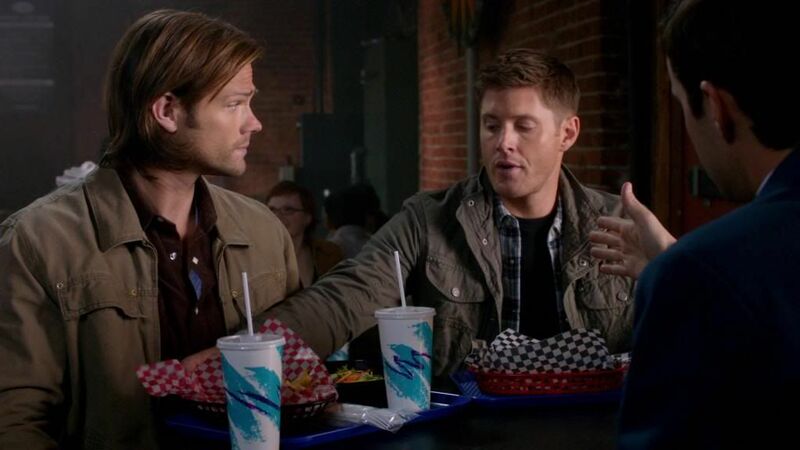 There's more to Sam and Dean than meets the eye. There is more to Josie too. The art has a lot of red and yellow. The best red is on Abaddon's nails and lipstick. I wonder where Knights of Hell fit in the hierarchy of demons. Ruby's knife only slowed her down like with Alastair. Her eyes are black though so does that put her somewhere below Azazel? 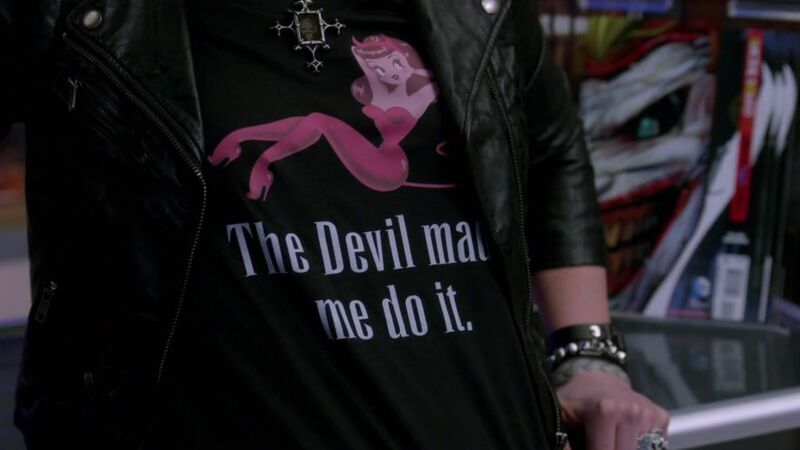 Does she answer to Crowley? I think she'd crush him like a bug. 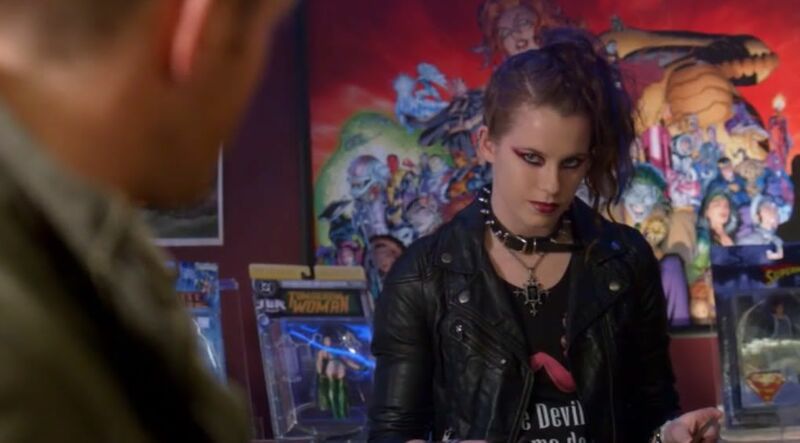 Has she been lost in time also so she wasn't available to fight for Lucifer? 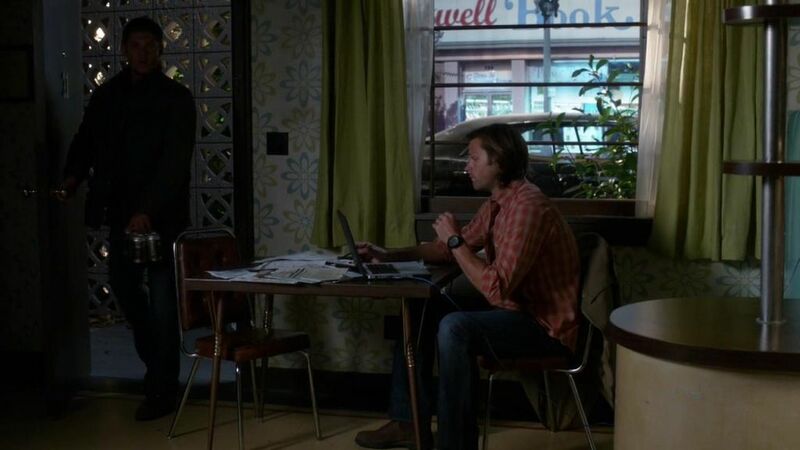 The Winchesters go tearing off, leaving a duffle in the room and then we get a better look at the motel. The crew even have a US flag on the pole. 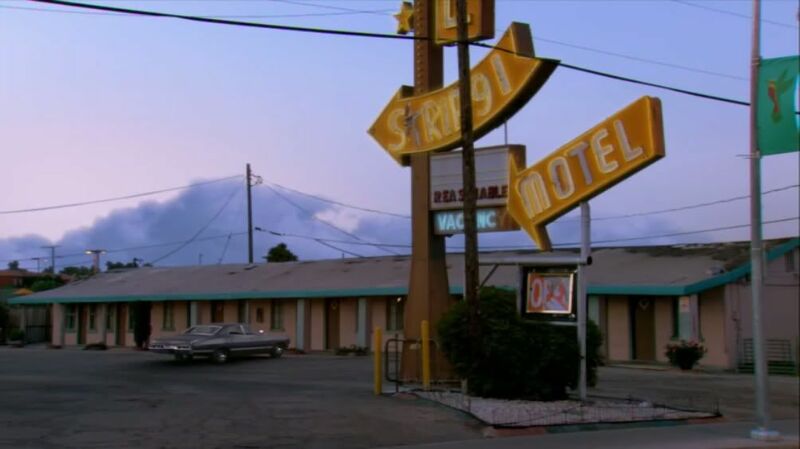 Here's that same motel from Party On, Garth. 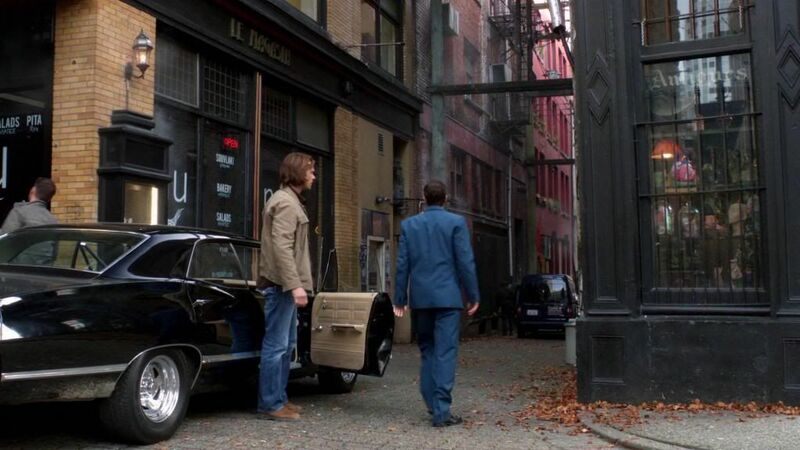 I'm so glad the boys got the Impala back. 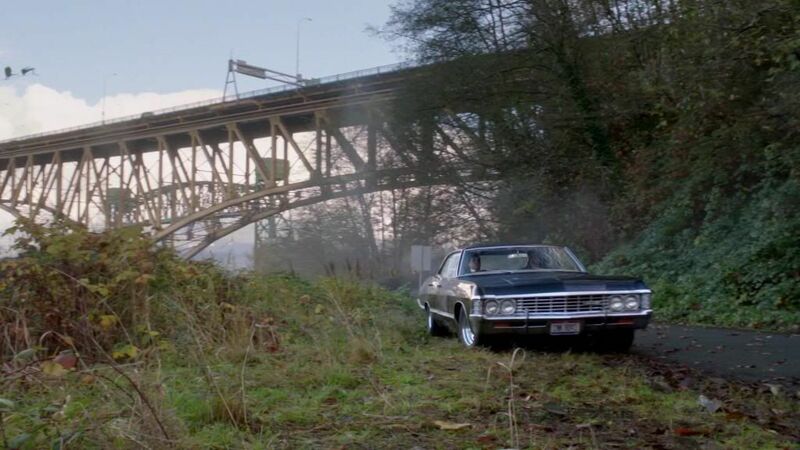 The setting for talking with Henry by the side of the road has an amazing bridge that reminded me of the big tressel by where John and the boys part company in season 1 and Dean and Sam get back together in The End. It's also still really green. I like how each person gets a different backdrop. 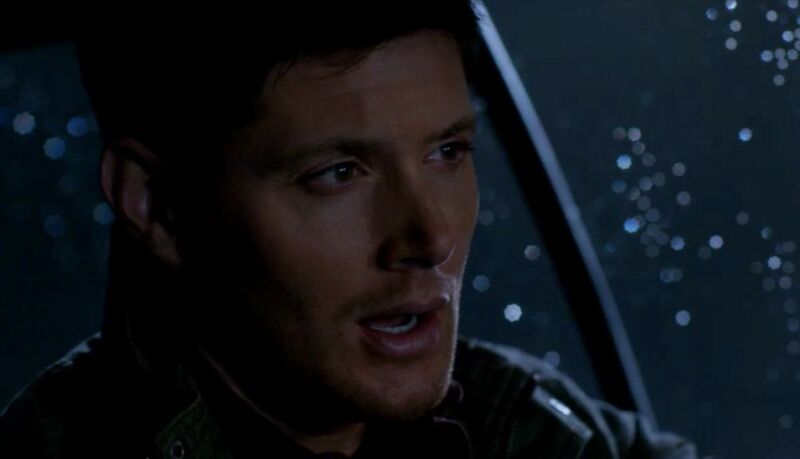 Dean with green leaves. Henry with a bit of green but mostly the side of whatever that might be. A building? 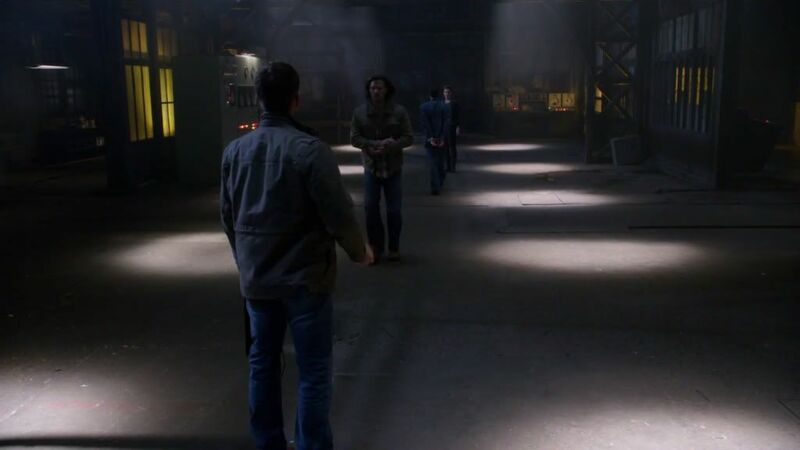 Sam gets the bridge and in a way, he bridges the gap between Dean and Henry. I like the nice little snip of the family music Americana they play at the end. 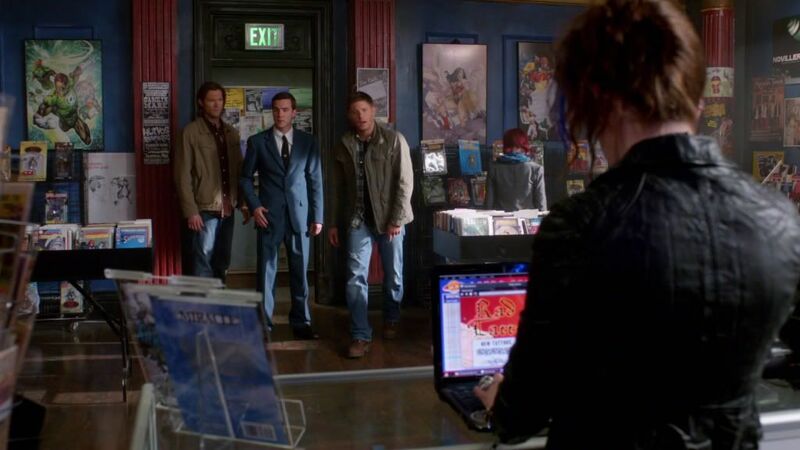 Henry is framed nicely between the boys. That black and white checked pattern is back. 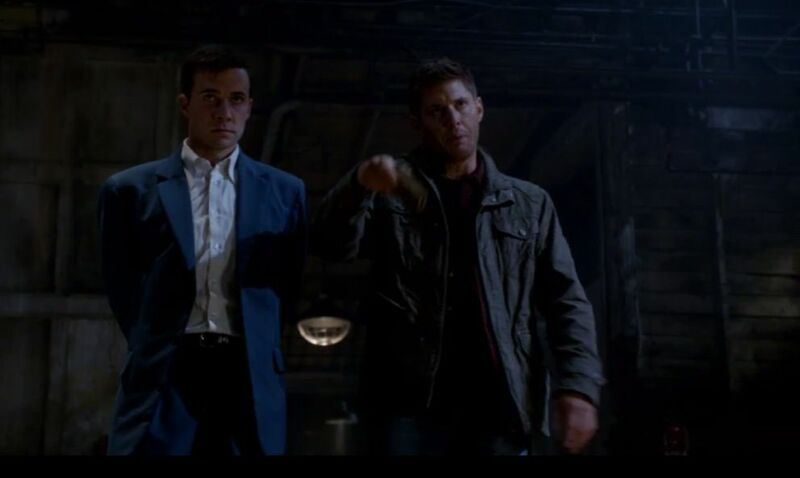 Dean hands Henry the red one but there's still plenty of blue. 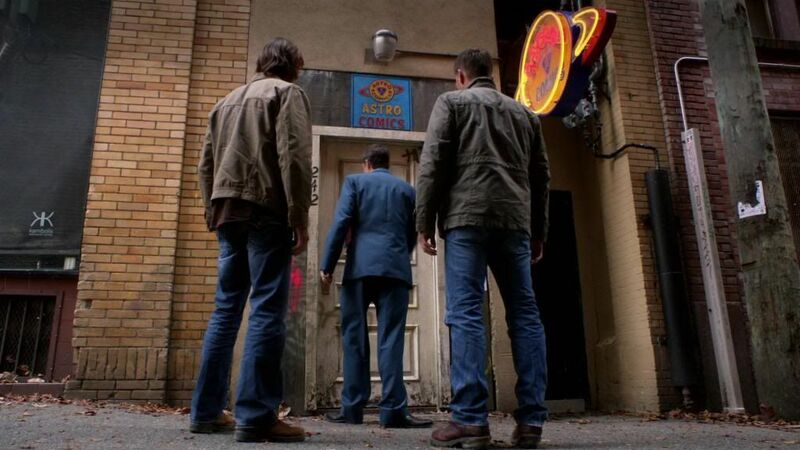 I like the angle of the shot at the door. 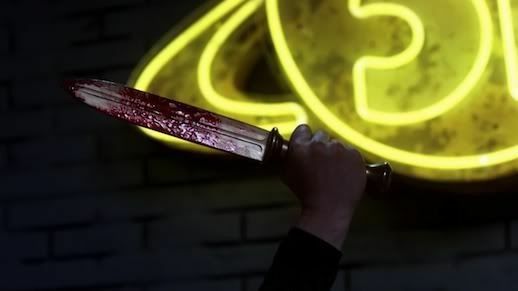 I'm wondering if the neon sign is part of the one used at the house of one of the victims in Slice Girls. Plenty of red and yellow but blue too. 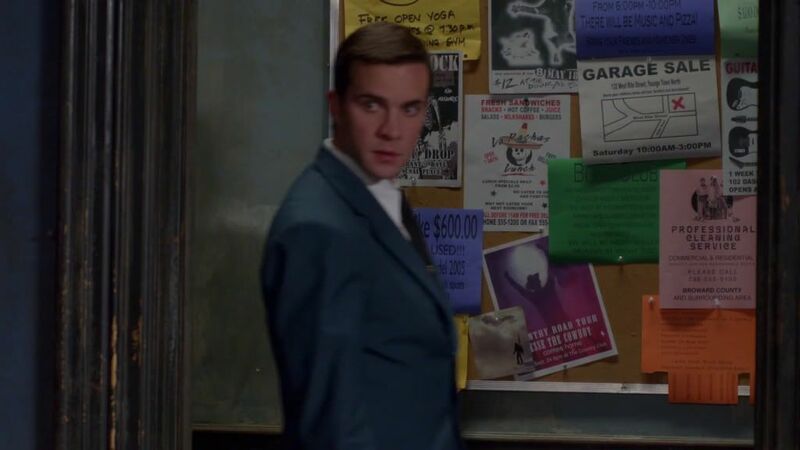 The DJ Sam poster has shown up a couple of times before. The blue follows Henry as he makes his way through the comic shop. Then there's this groovy sign stuck in here. Henry jumped right over the 1960's. Maybe that is also part of why he is so naive. The bulletin board has some cool things. 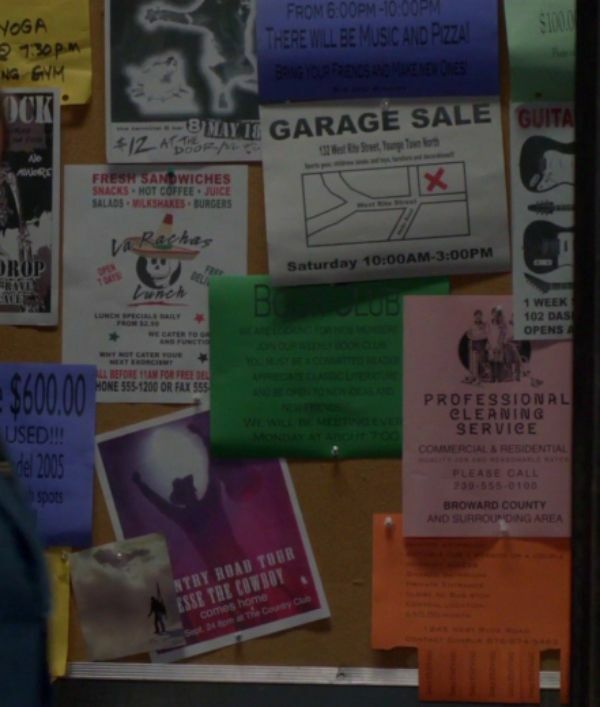 The pink flyer is for a cleaning service for Broward County (the location for Mystery Spot) and the Mexican restaurant flyer is for what looks like someplace called La Rachas. Racha means gust of wind in Spanish if you can trust online translators. Whatever it is, they're offering to cater your next exorcism. 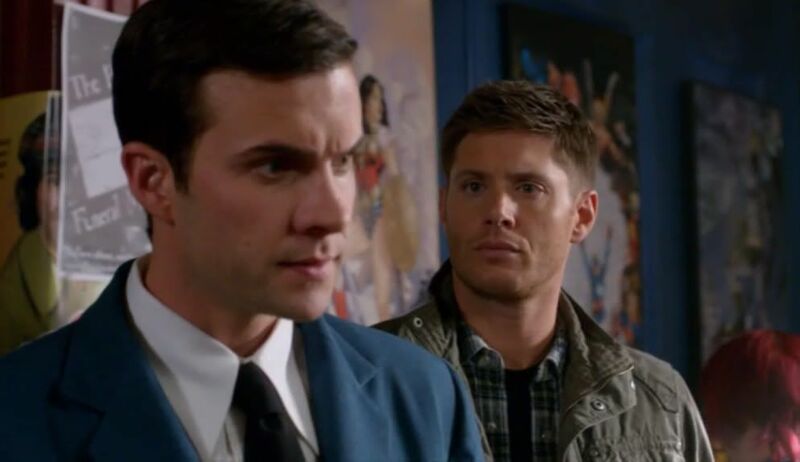 I admit to not knowing my superheroes but I think that's Wonder Woman behind Dean. This woman on the wall has made an appearance before, only you could just see her face. I don't know who Sword Guy is. Now the rest of the mural is visible and it's creepy. 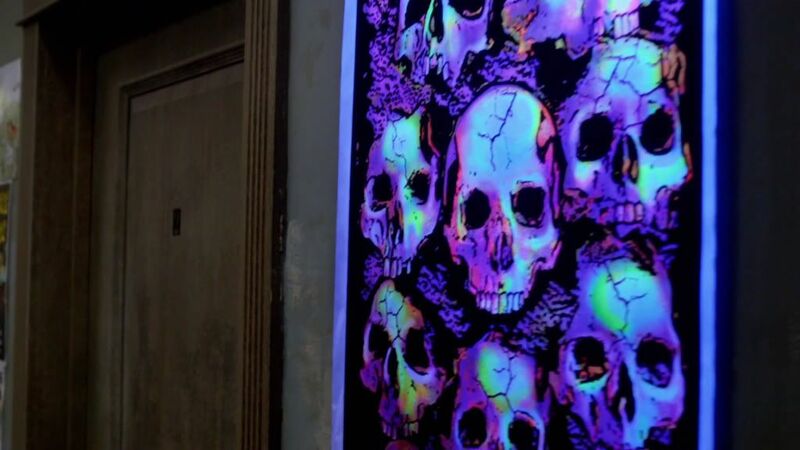 We originally saw it on the wall of the tattoo parlor where Mrs. Tran and Kevin got inked in What's Up, Tiger Mommy? 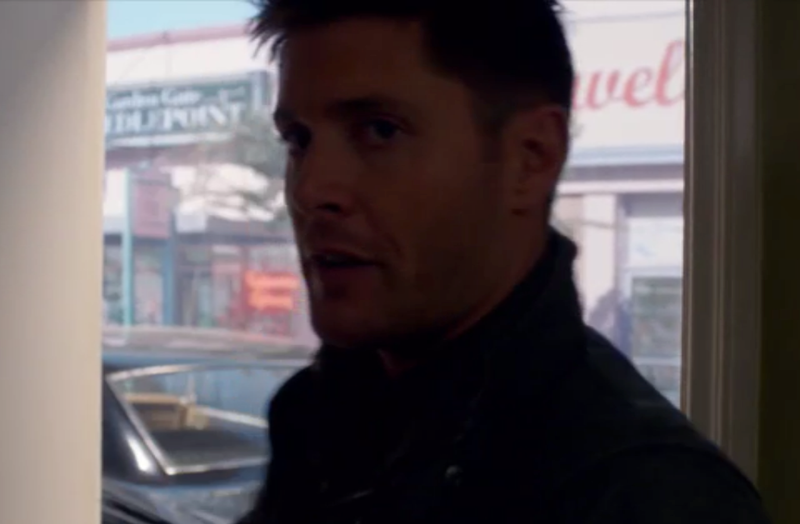 Is that an Impala behind Dean? 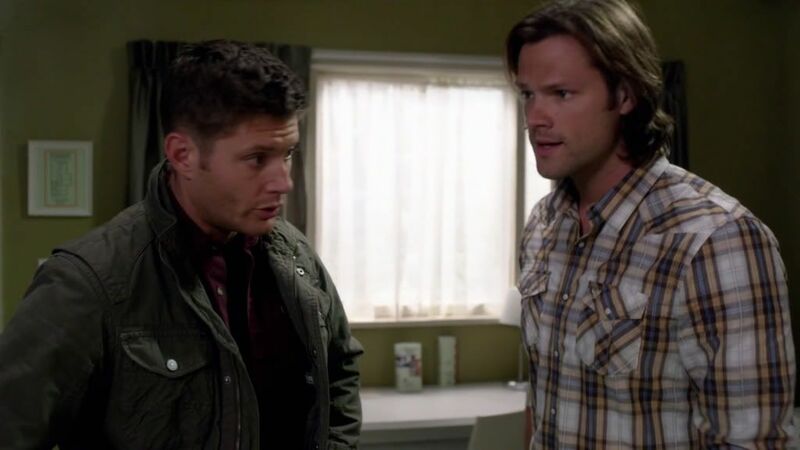 Sam and Dean were wearing pretty much the same shirts that day too. The box in the cabinet with the Hulk-like character says Hush. Maybe that's the Joker on the counter? Maybe the Green Lantern beside Sam? There's some sort of Superman thing on the counter. The shirt says it all. The red is still really present during the visit from Abaddon. 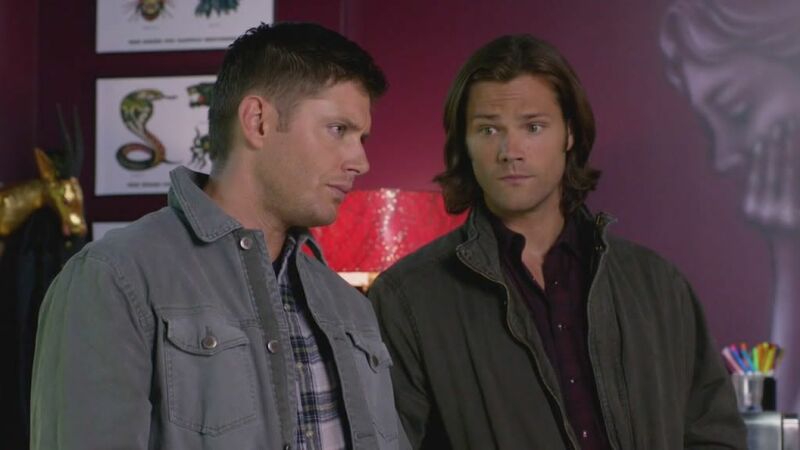 I like the almost-symmetry of their makeup and hair. 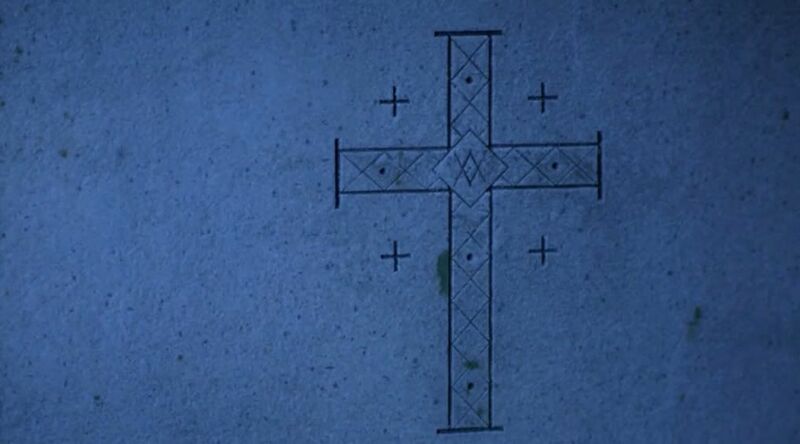 Meanwhile, the Winchesters have moved on to the cemetery. I think this might be my favorite shot with the red and yellow sign and a little blue plus the billowy clouds. Enough letters are burned out that part of the sign reads RIP. 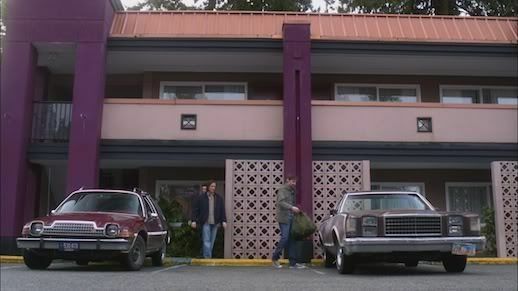 In the morning light, this motel is one of the worst dumps the Winchesters have stayed at that's not abandoned. The inside is another matter altogether. There are so many geometric shapes that show up plus plenty of yellow. 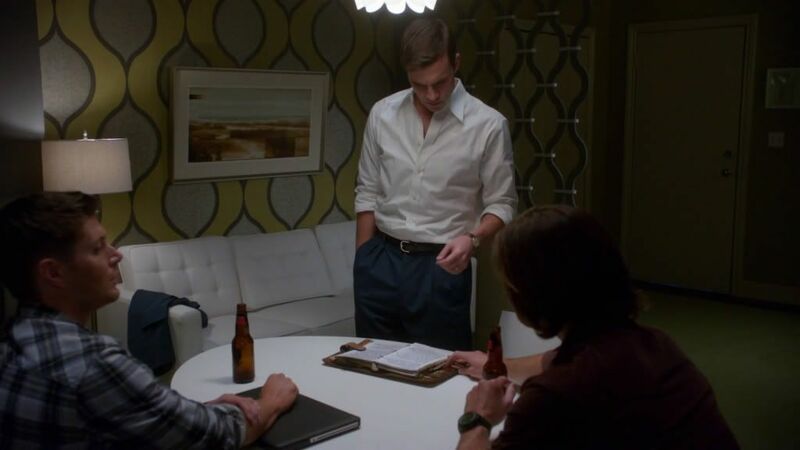 I like how the light shines off the snaps on Sam's shirt and they fit right in with the squares and diamonds on the bedding. Henry seems remarkably relaxed for a guy being chased by a Knight of Hell. This wallpaper is spectacularly awful. There are tiny leaves in the inner ovals. ash48 posted a great entry about Jerry Wanek's comments about the shapes in the wallpaper. He said they have to do with time. I didn't pick up on it until he mentioned it. I thought the divider looked like the struts under those big folding tables. 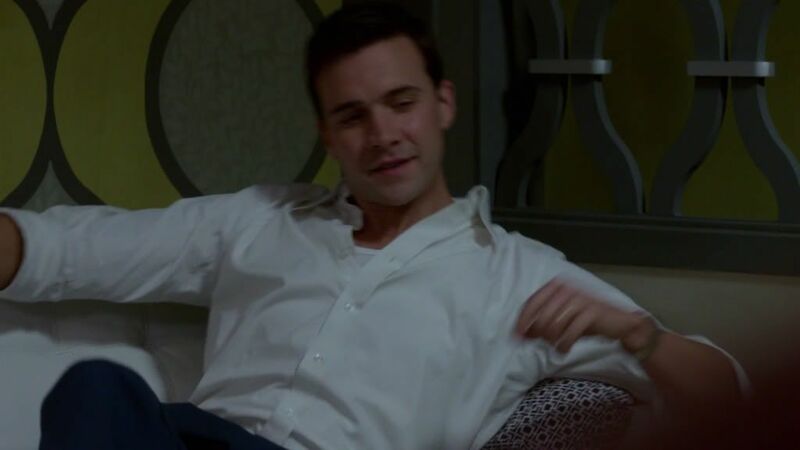 I like the white furniture. And the awesome lotus-like light. So the wallpaper was chosen possibly because of the hourglass shapes. I think maybe the picture might be the sand. 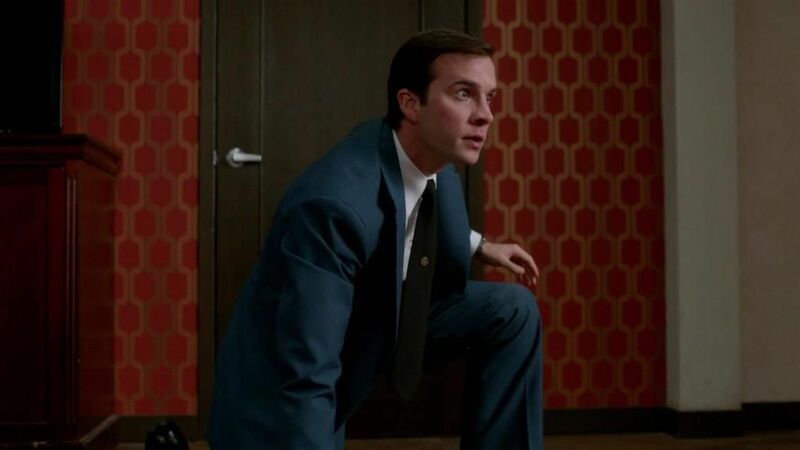 The red wallpaper in the earlier room had a similar design on a much simpler, smaller scale. 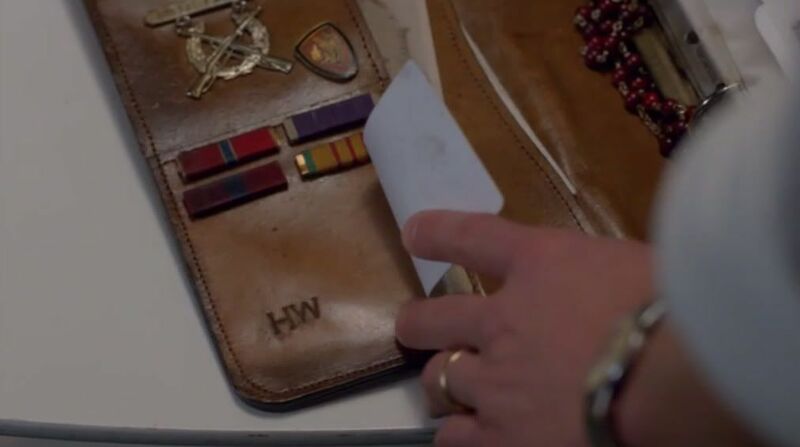 I liked the closer look at John's journal. 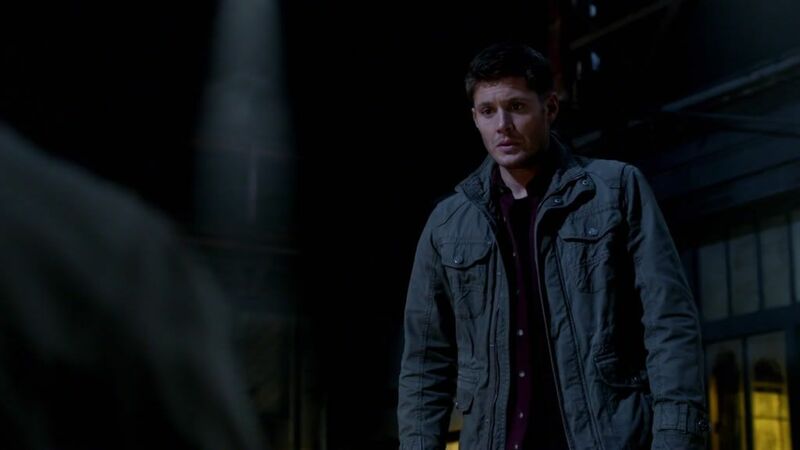 Then Dean stands behind Henry while he talks to him. 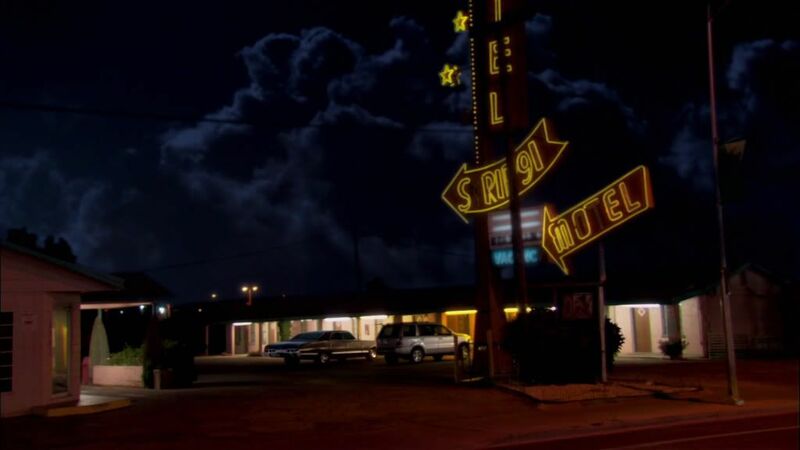 A blue light shines in the window and it turns out it's from a motel sign used in another episode. I'm going to figure it's really here because of the blue light. It's from the Liberty Motel in I Believe the Children Are Our Future. 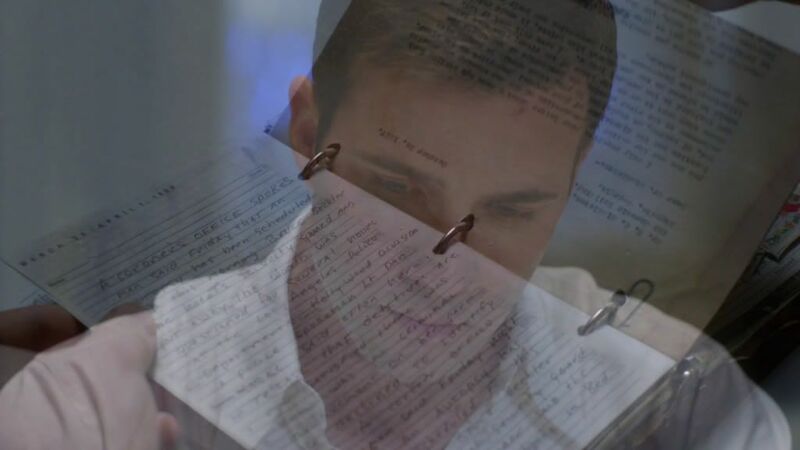 Then Henry sits down to go through John's journal. 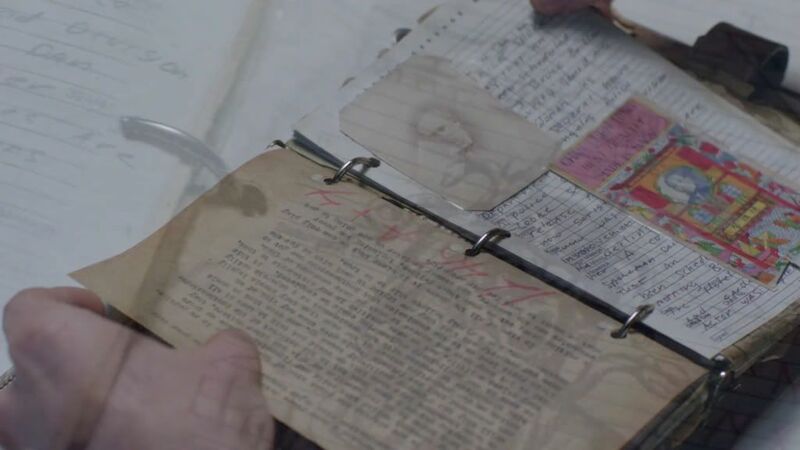 I like the way they showed the passage of time and paging through the journal by overlaying the images on top of one another. 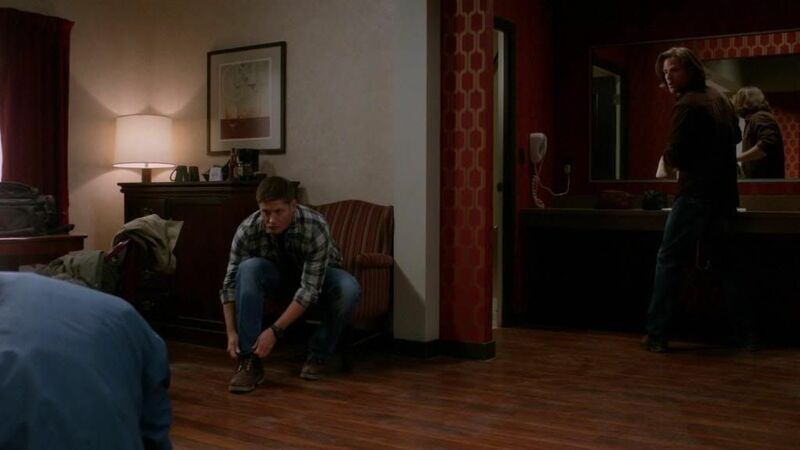 Dean's back from wherever he went and he took his boots off so he can't be entirely freaked out. By morning, he'd gotten a pillow from somewhere. 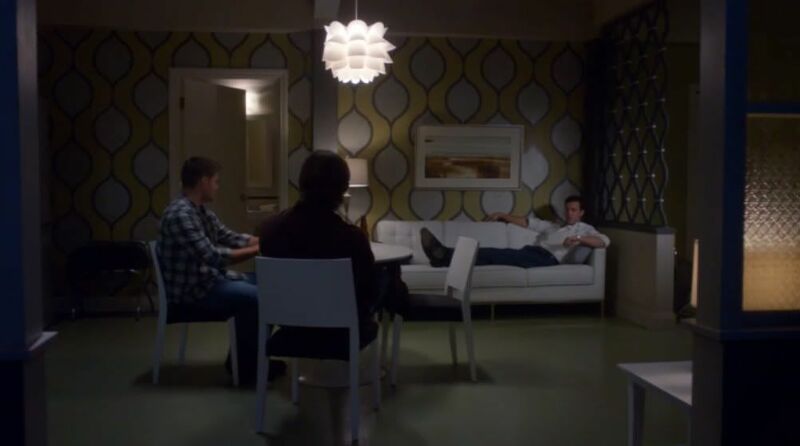 Maybe Sam's or maybe the one Henry was sitting with on the couch. 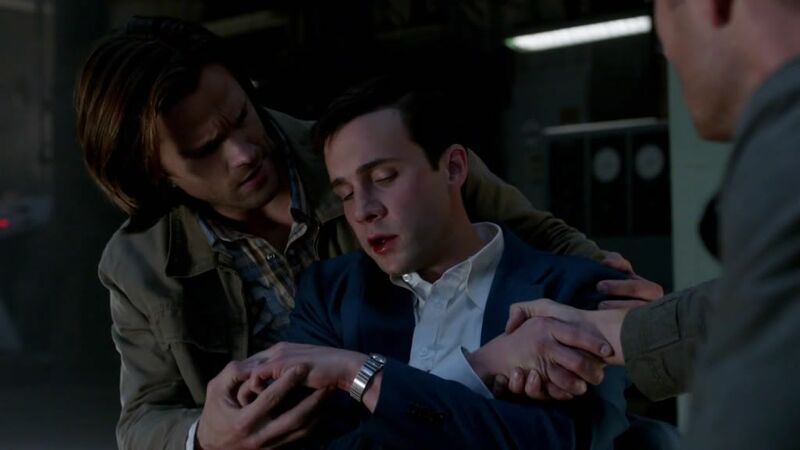 Sam wakes him up in the time tested way of little brothers everywhere. Whack. The set looks so different in the daylight. 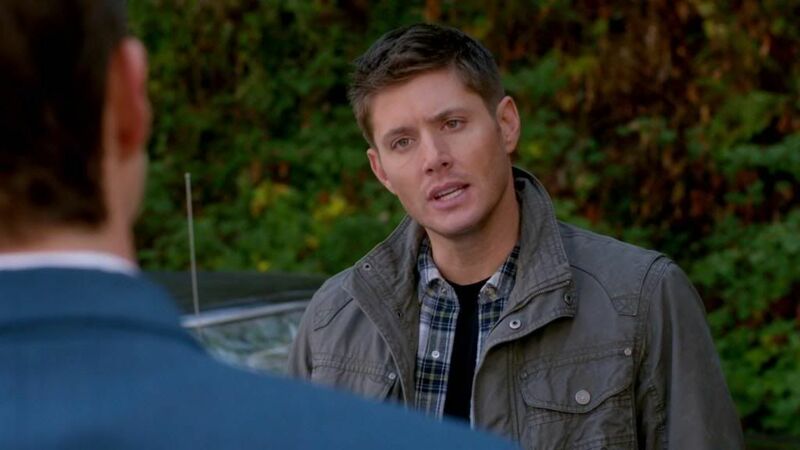 Sam was in red yesterday and now Dean is. 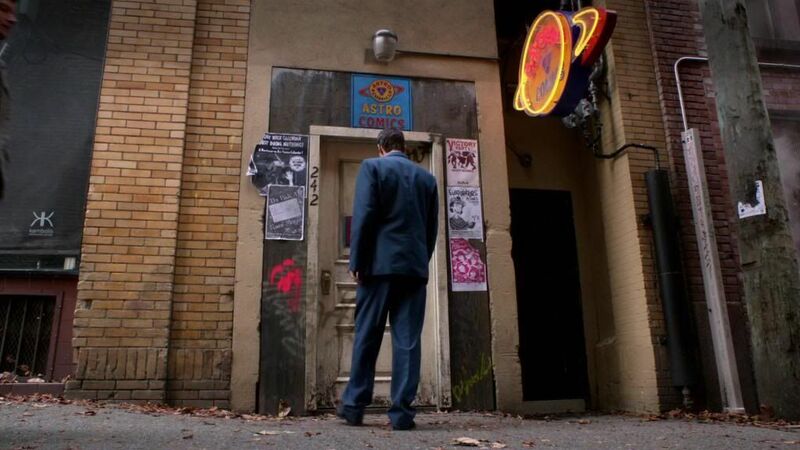 At one point Dean walks in the door and you can see buildings behind him that were in an earlier episode. Maybe it's footage from earlier but I don't think so. 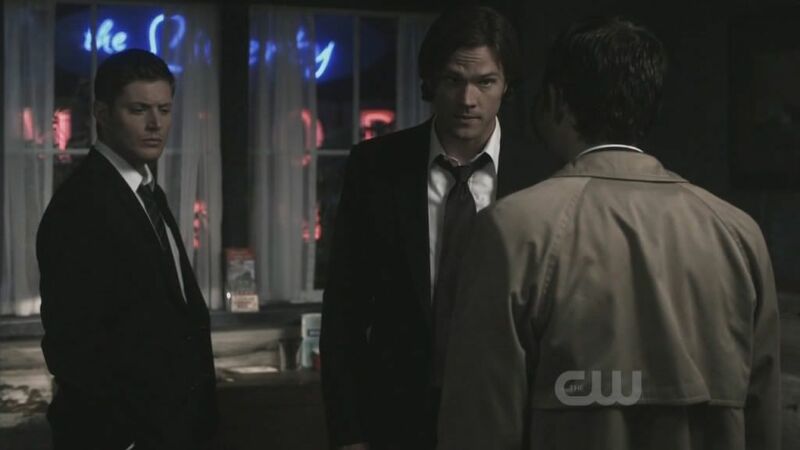 It's the one with the reappearing Cas, A Little Slice of Kevin. Henry's done a runner and gone to try to go back. 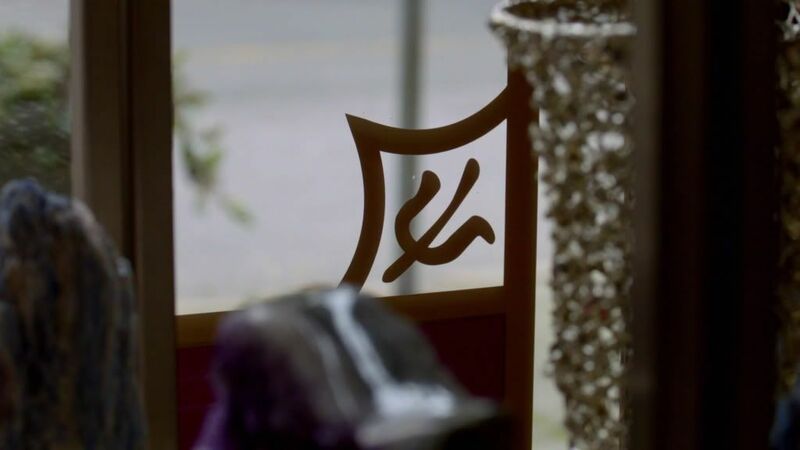 The windows of the store have a similar symbol to what Lucifer put in the frost of the window in Swan Song. 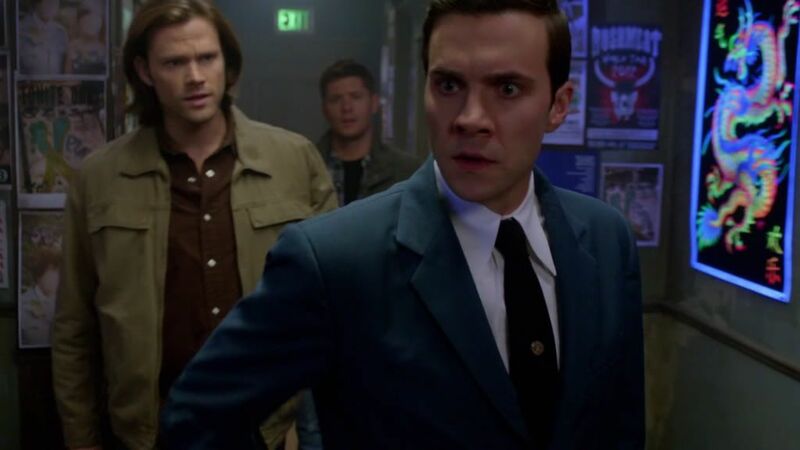 Somebody needed to tell Henry that Winchesters splitting up never ends well. If we were still worried about flowers, this would be a disaster. Regardless, there is a lot of red and yellow here. 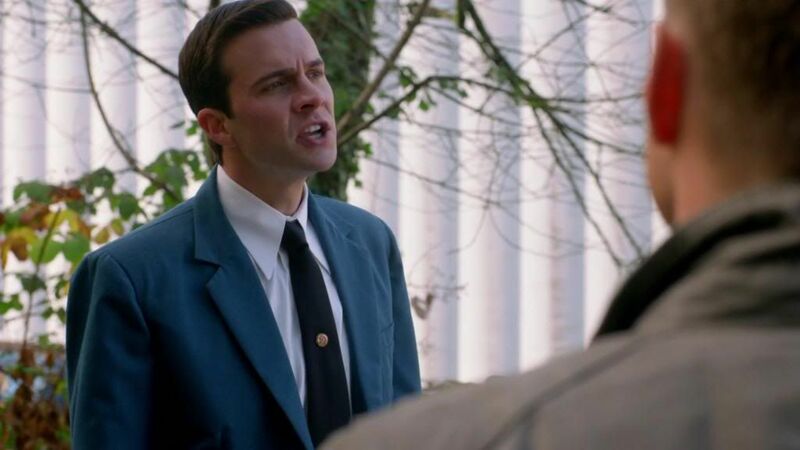 Samspurpletoothbrush over on Tumblr pointed out that this is footage filmed for Dead Men Don't Wear Plaid. It's a good thing these guys hang on to clothing. Cool green boat on the table. I felt bad for this man. He knew all about the resources locked up by the key but couldn't get to them. He must have realized that apocalyptic things were happening but wasn't able to do much about them. 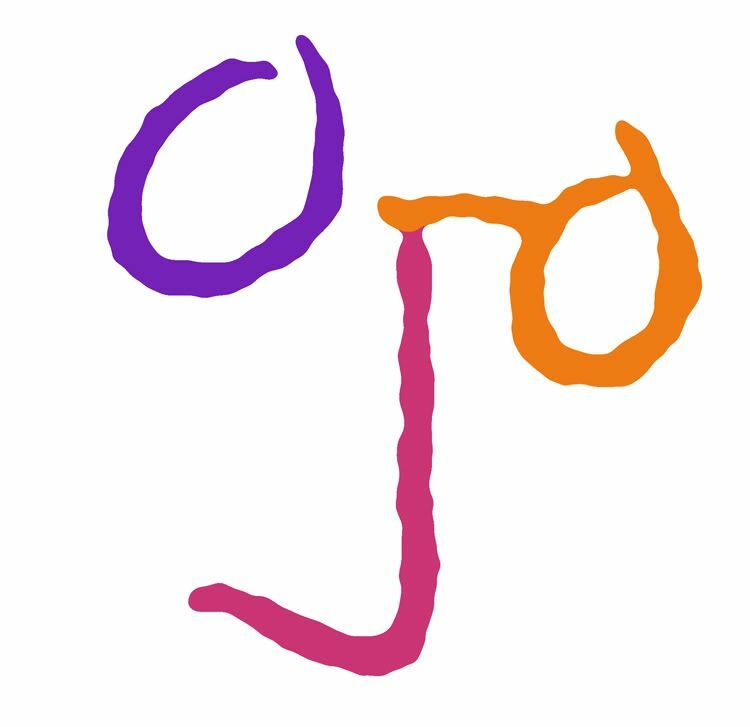 I wonder if he continued to chronicle everything that happened in the meantime, even though he was blind. This poor woman with her red sweater and green plants. Sam's backed up by a bunch more green trees. 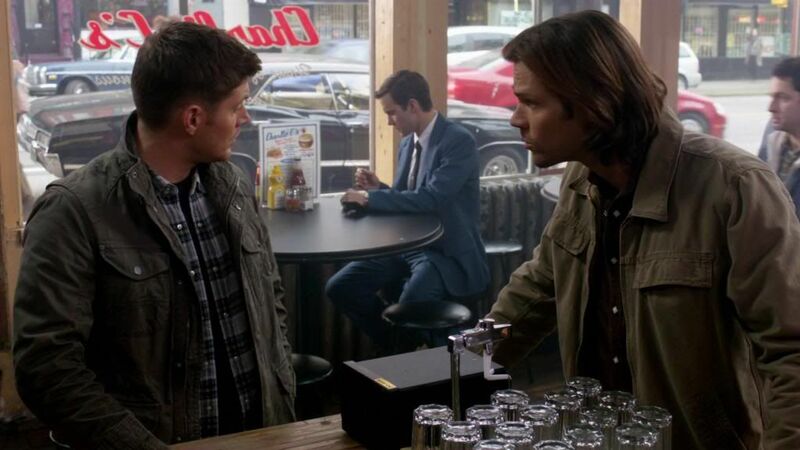 Other than the blue on Sam, there isn't much in this scene. There are green chickens though. I love the biker boots on the lace tablecloth and the beehive. 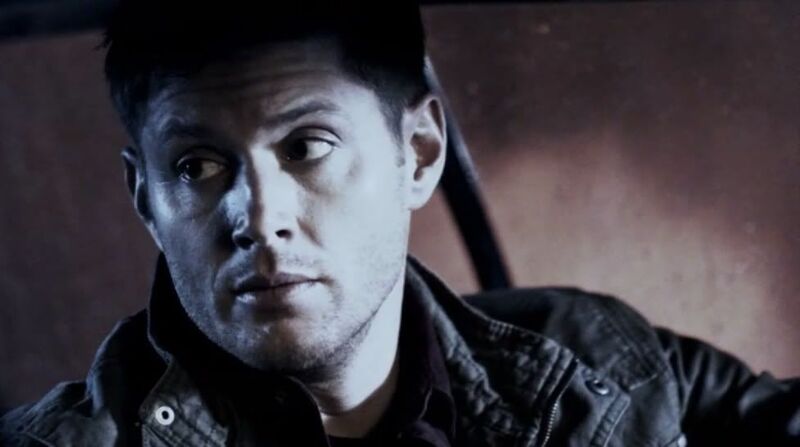 Somewhere along the line, Dean must have got the window repaired. Off to the warehouse with angel lights and red and yellow. There's a danger sign on the wall and big circles of white light. There's an angel light inside too. The actors stay out of the white light circles for the most part. All the red and yellow behind Henry. You pretty much knew this wasn't going to work out well for Henry. 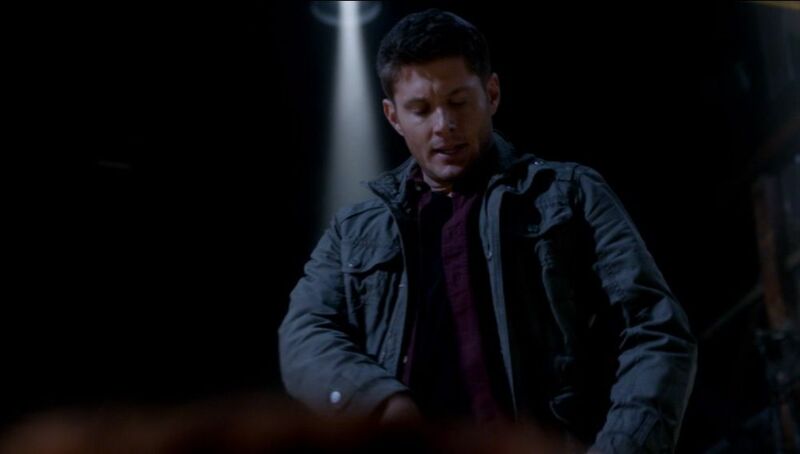 Dean, backlit by a beam of white, beheads the body being possessed by the demon. 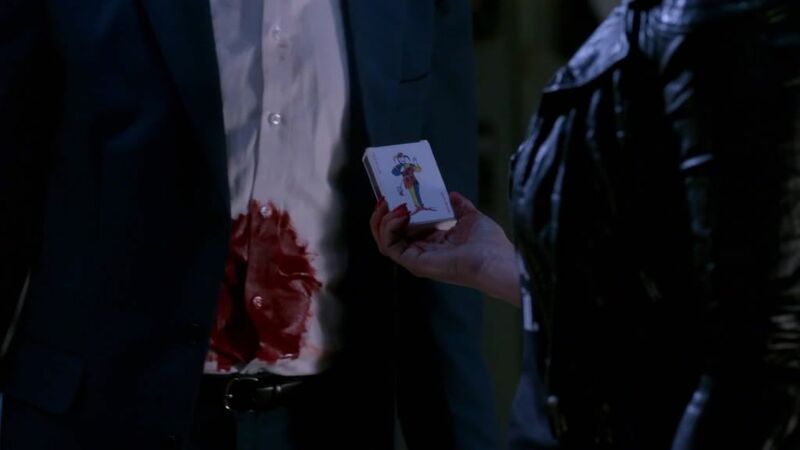 What happened to Josie? 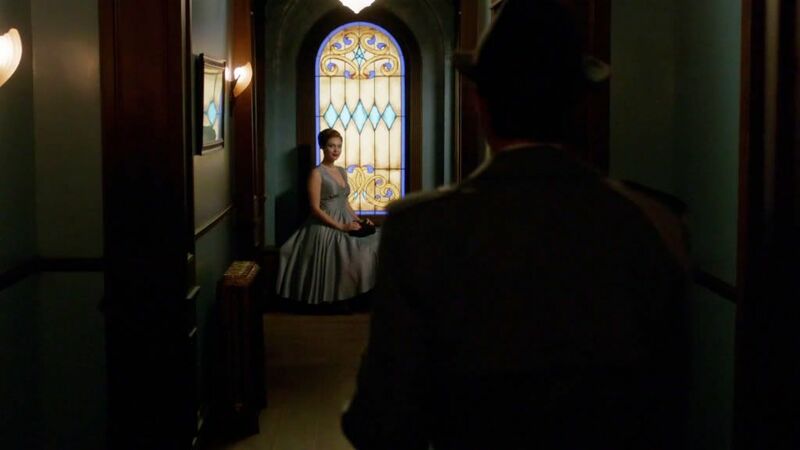 Did her soul escape or is she locked in there with Abaddon forever? 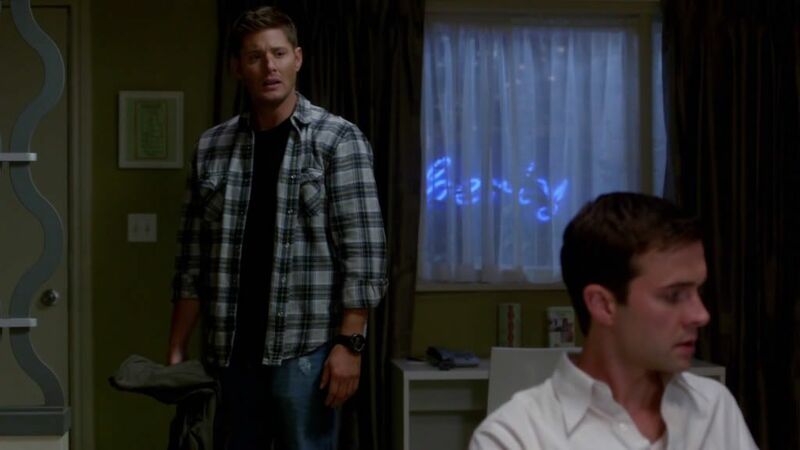 As soon as the monologue is over, the light isn't the focus behind Dean. 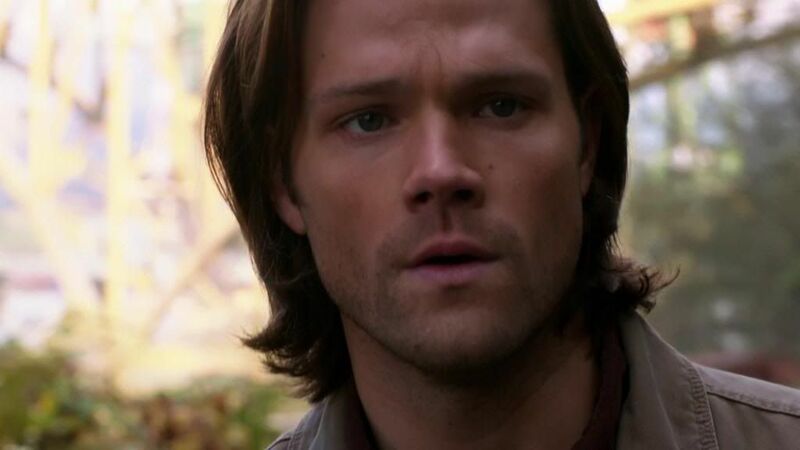 When we see the flashback, it's different again from Sam's memories of Amelia or of Dean's Purgatory time. We're not really seeing anyone's recollection. It's also different from the light in 1958 which we were seeing as it happened, even though it was in the past. Here we're just seeing the action looking back at it. I like the way the gold is brought out here. 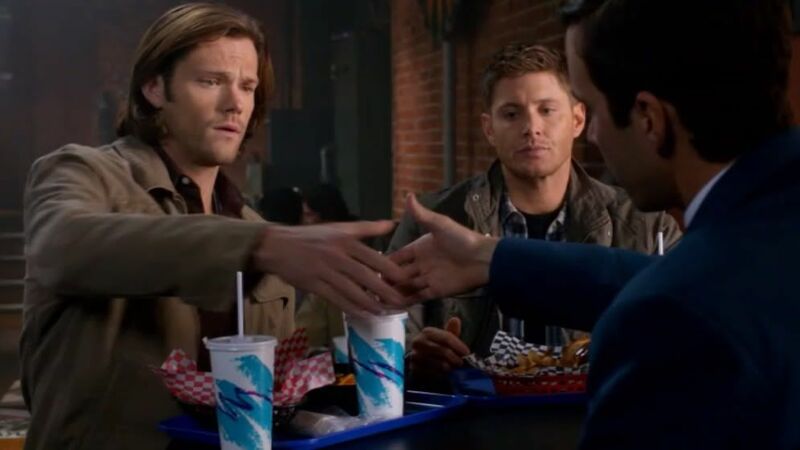 So Dean and Henry finally shake hands and Henry hands the key to Sam and dies to the sad family music. 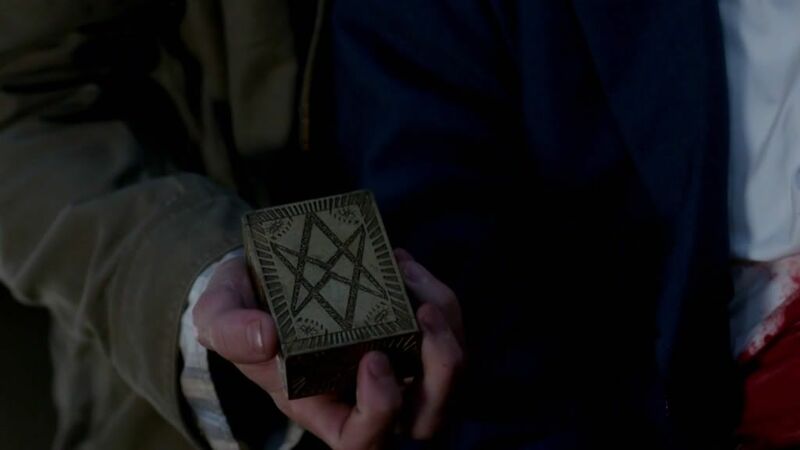 Sam is left with the box. 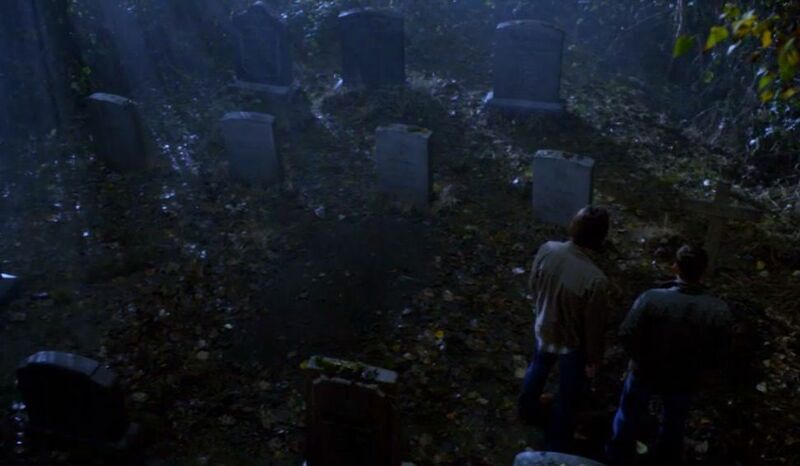 The last shot is of the guys surrounded by the dead at the cemetery. Sort of echoes their lives. Caps from homeofthenutty, grande_caps and me. Adam Glass wrote this episode and he's written quite a few in the last couple of seasons, among them Like a Virgin, Mommy Dearest, Party On, Garth and Southern Comfort. There are a couple of elements of this plot that are similar to the resolution of a couple of his others. Wow, you're absolutely right! The whole quick flashbacks to something the viewers weren't shown the first time around. That would get kind of repetitive if show had less writers. 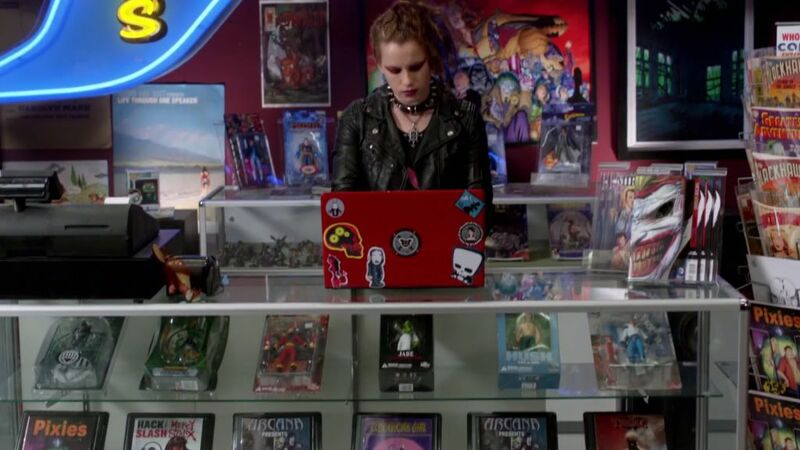 And behind the counter there's a poster with a blue sky that says "Life through one speaker" that was also in bathroom of the house in 8x04 "Bitten". 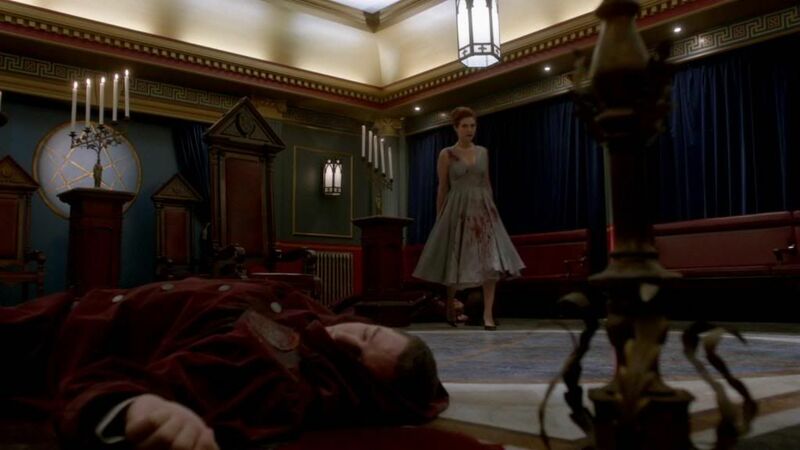 The red wallpaper in the earlier room had a similar design on a much simpler, smaller scale. The pattern on the red wallpaper kind of looked like links in a chain. 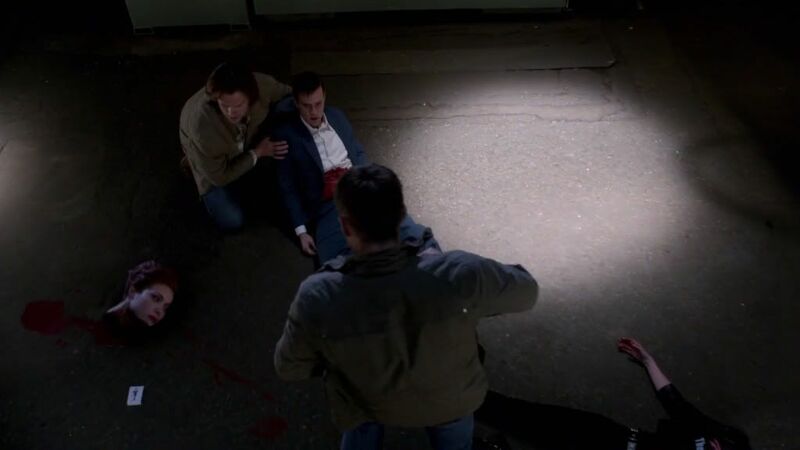 Which could also be a nod to blood finding blood - even though Henry didn't quite reach his son, he found his grandsons. I like the idea of the red wallpaper being like a chain. 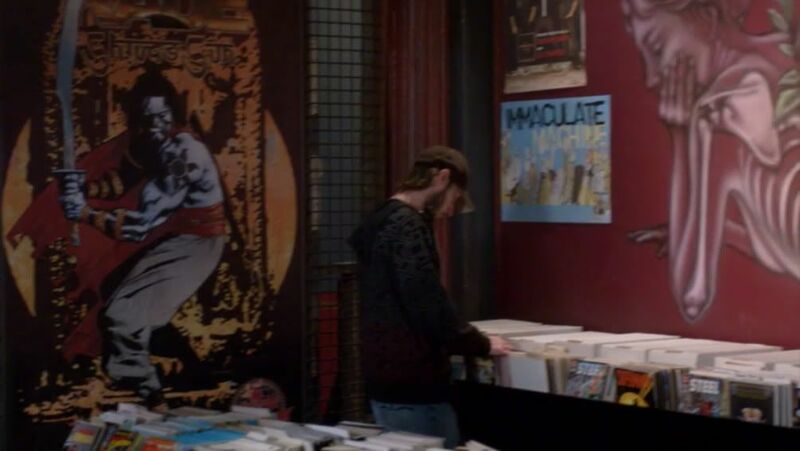 I remembered that 'one speaker' poster and I think there may have been a band poster in the hallway from Bitten also. There was so much tucked in there that I'm sure I missed. I really liked the dragon. I wonder if the mural with the bones and roses is something portable. I don't think it's the same wall. Good catch there with the Hardy boys. 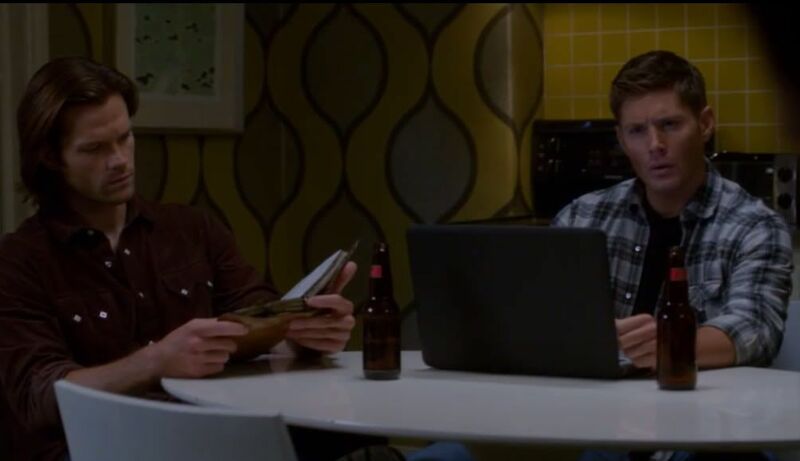 I would never have noticed those books if you hadn't pointed it out. 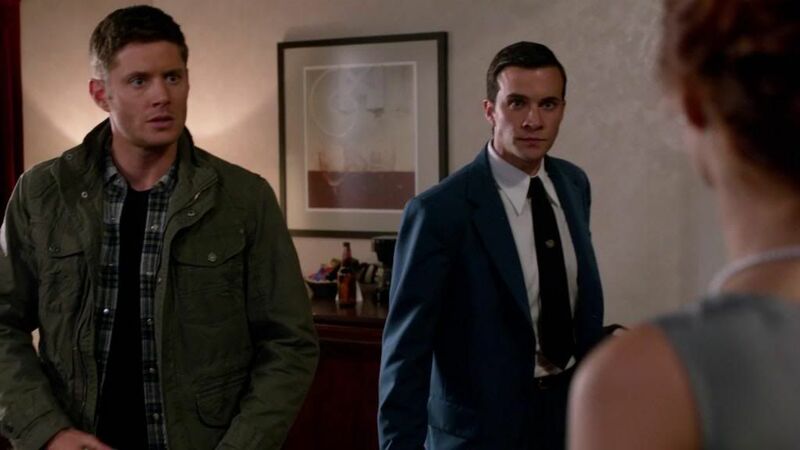 Who would have guessed that young John would end up with his own Frank and Joe! 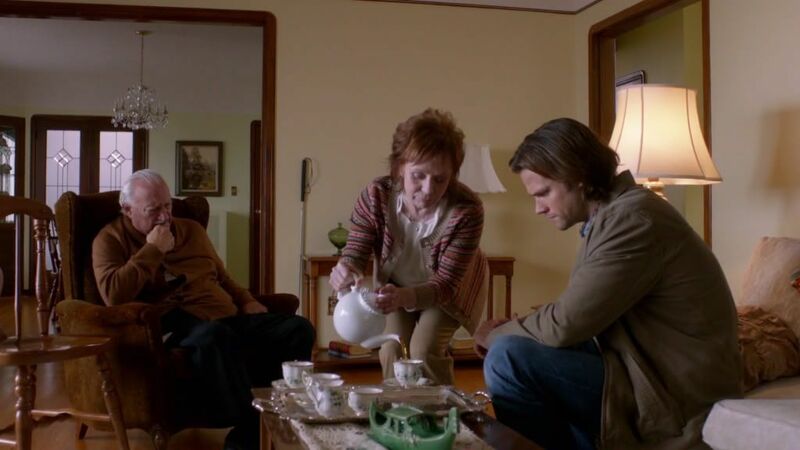 The episode really underlined how much of a tragedy the Winchesters have lived beginning with John.